"Nai Choy Saeteurn, 10, of Salem died Tuesday. He tried to save his cousin from drowning and drowned himself. He was born in a refugee camp in Thailand and arrived in the United States in 1986. He attended Washington Grade School and had just completed the fourth grade. He attended the Presbyterian Church. He is survived by his parents, Sheng Linh and Fam Hinh of Salem; brothers, Kao Choy and Sun Choy, both of Salem; sisters, Meuy Choy and Muang Choy, both of Salem; grandfather, Fou Ling Saetern of Salem; and grandmother, Koy Finh Saechao of Salem. "Dessie E. Sanders, 61, of Joshua Tree, Calif., formerly of Salem, died Monday. Born in Missouri, she moved to Joshua Tree two years ago from Salem. Survivors include her husband, Ted Sr.; sons, Mike Craig and Theodore II, both of Salem, and Lonnie, Joshua Tree; and a daughter, Elizabeth Wuben, Boring. 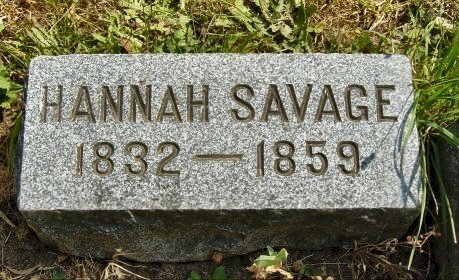 "Savage---At her residence, near Salem, Tuesday, Feb. 28, 1888, Mrs. H.W. Savage, aged 44 years, 8 months and 18 days. 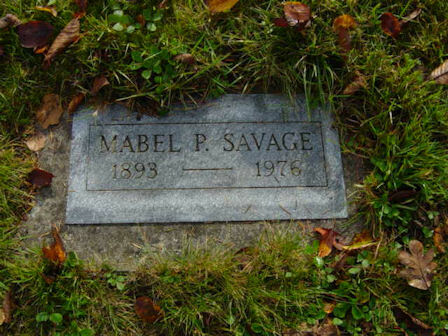 "Pioneer of `47 Passes Away--Mrs. Ellen Savage Crossed Plains With Parents as Child of Four Years--Long Resident of Salem Was Born in Missouri in 1843--Was Married to M.L. 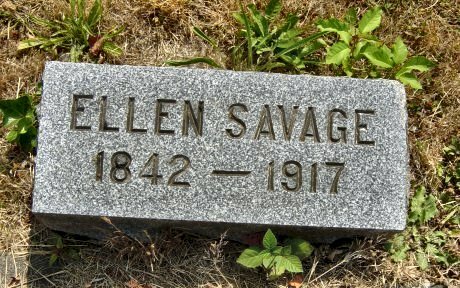 Savage in 1861--Two Sons and Three Daughters Survive--Mrs. Ellen Savage, who crossed the plains to Oregon in 1847 as a child of four years, died at the Salem hospital shortly before midnight last night. She had been ill for more than a year. 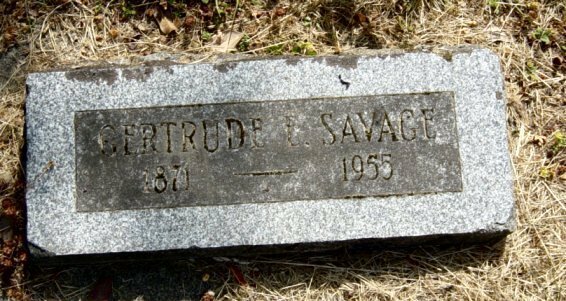 Mrs. Savage was born in Missouri in 1843. She crossed the plains with her parents when four years old and has resided in Salem continuously since. She was married in 1861 to M.L. Savage who died several years ago. 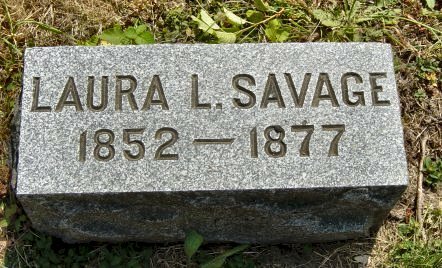 She is survived by two sons, Robert H. Savage and Lute Savage, and three daughters, Miss Gertrude Savage, Mrs. Ralph McAdams, and Mrs. A.C. Reily. 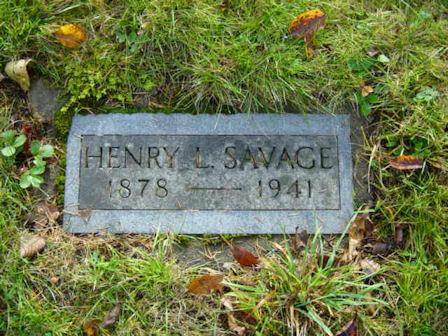 All are of Salem except Mrs. Reily whose home is in New York, N.Y.
"Frank Savage Is Taken Suddenly -- Frank Savage, son of the late Henry W. Savage, died suddenly in Mullin, Idaho, Wednesday morning, according to word received yesterday by relatives. Death is believed to have been due to heart trouble. His widow, Elma Savage, will leave today for Salem with the remains. Funeral services will be held here, time and place to be announced following arrival of the body, however relatives believe the services will be held Saturday. 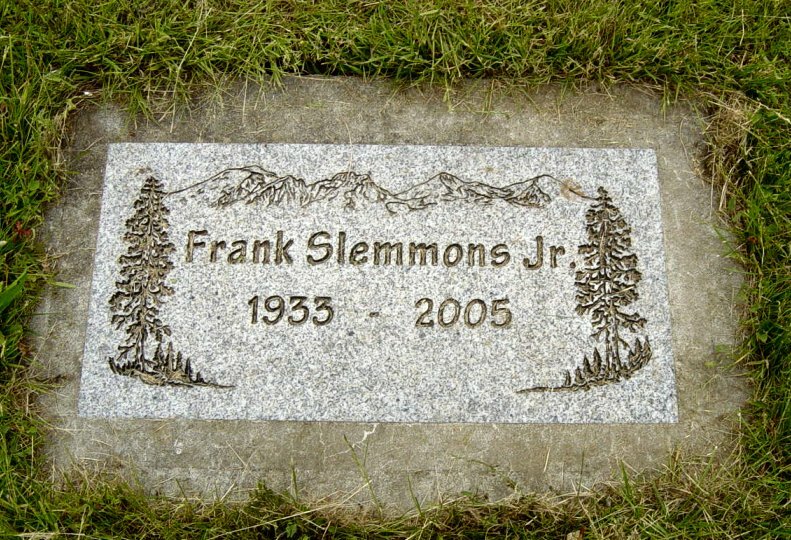 Frank Savage was supervisor of a lead mine in Idaho at the time of his death, and had been engaged in that pursuit there for approximately 25 years, working at mining in Wallace, Burke, Murray and Mullin in that time. 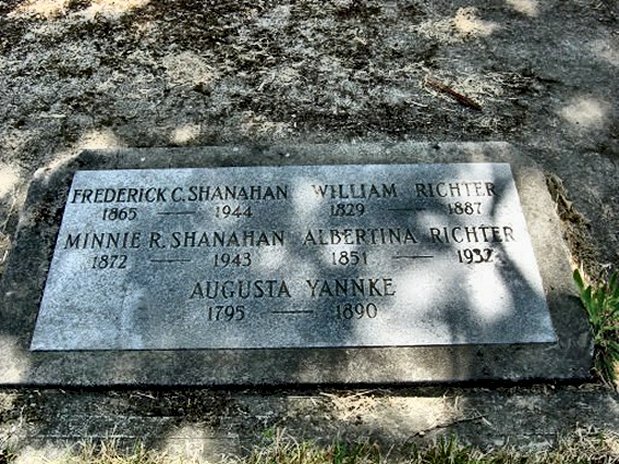 He was born in Indiana May 22, 1865, and when 14 years old came to this county with his parents. He lived in and around Salem for nearly 25 years before going to Idaho. He returned to Salem from Idaho two years ago, purchased a home on the Garden road and intends to retire, but remained only a year, the lure of the mines recalling him to Idaho a year ago. He was gardener at the asylum here a number of years ago. 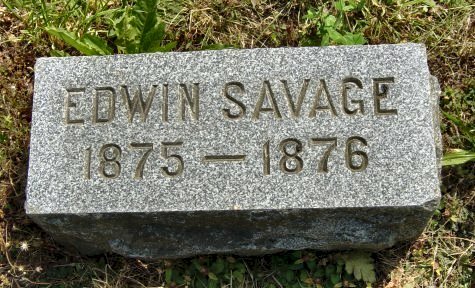 Besides his widow, Elma, he is survived by the following brothers and sisters: Mrs. Al Rasmussen, Nancy, Helen and Mabel Savage, Harry and Jesse Savage, all of Salem; Henry L. Savage of Oregon City and Ben Savage of Independence. Mrs. Ben Ramseyer and Mrs. Albert Ramseyer of Salem are half-sisters, also. His stepmother, Mrs. H.W. Savage, also lives here. "Salem Woman, 84, Succumbs--Gertrude Elenore Savage, 84, of 1362 Plaza St., died Monday at a Salem Hospital. She was a retired nurse. 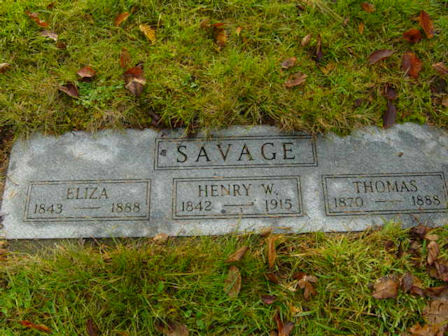 "Old Citizen Dies--Henry W. Savage Was Salem Resident Since 1877--Leaves Widow and Eleven Children. Funeral to Be Held Tomorrow From Garden Road Home.--Henry W. Savage, for fifty years a Mason and a resident of Salem since 1877, died at his home on the Garden road, two miles east of Salem, suddenly yesterday, following heart failure. He was 73 years old, and had been engaged in gardening in the vicinity for thirty-eight years. The funeral will be held Friday at 10 a.m. from the residence. Burial will be in Lee Mission cemetery. 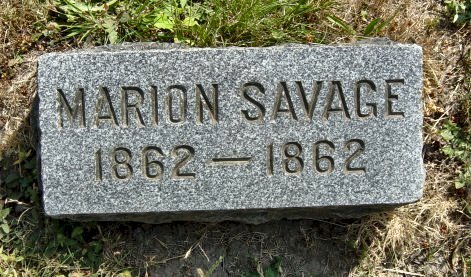 Mr. Savage was born in Ely, England, July 4, 1842, coming to the United States and settling in Indiana when 16 years of age. He lived there and in Illinois until 1877, when he came to Oregon, settling on the farm where he lived until his death. "Late resident of 2999 Market NE, Salem, in a local nursing home, Friday, June 18. Survived by sisters, Helen Bergsvik, Bellingham, Wash., Maude Ramseyer, Salem, Nancy Von Escken, Salem, Kate Rasmussen, Salem. 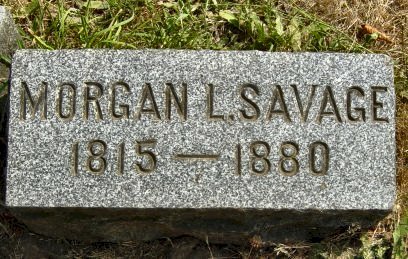 SAVAGE, Morgan Louis " Lute"
"Savage---Near Salem, Saturday, Feb. 18, 1888, at 8:15 p.m., Thomas, son of H.W. 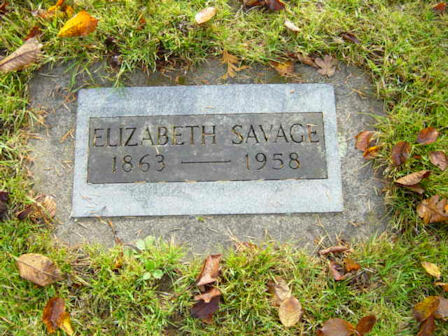 and Eliza Savage, aged 19 years, 9 months and 25 days. "Noted Oregon Banker Dies--Corval-lis, July 28--William Henry Savage, 82, Corvallis banker and Oregon fair board member for 30 years, died here Monday. Long active in politics and frater-nal organizations, he had served as president of the fair board and was in charge of Oregon exhibits at the 1893 Chicago World's fair and the Lewis and Clark exposition in Portland in 1905. He was born at Kirbyville, the son of William and Catherine McDonald Savage, early Oregon settlers. He resided in Salem until 1885, married Miss Carrie Woodcock there, and then moved to Corvallis. Surviving are the widow and two sisters, Mrs. John D. Peck, Seattle, and Mrs. A. Nelson, Albany. "Baby girl Schaefer, infant daughter of Mr. and Mrs. Charles A. Schaefer of Salem, route 4, at a local hospital, June 16. "Muriel Ida Schaefer, 81, of Salem died Monday in Salem. She was born in Valley, Idaho, and came to Salem 25 years ago from California. She had owned and operated a grocery store on 19th Street in Salem. Survivors include her sister, Letha Brokke of Salem. "Mrs. Helen Rose Schanz, 3093 Tess Ave. NE, died Monday at the home of a daughter in Salem at the age of 83. Survivors include daughter Helen Greiner, Salem, and seven grandchildren. "William Paul Schanz, 78, 806 Thompson St. NE, died Tuesday at his residence. A native of Wisconsin, he came here last year from The Dalles. He was a retired farmer and a veteran of World War 1. Survivors are the widow Helen; daughter Mrs. Helen Greiner, Salem; half-brother Edward in California; seven grandchildren and 10 great-grandchildren. "Last Rites Here For Lena Schaarf--Mrs. Lena Schaarf, former Salem resident and for many years active in Salem church affairs, died Monday at the home of her daughter, Mrs. Arthur L. Beckendorf, in St. Paul, Minn., Salem friends have been informed. "Herbert Jacob Scharosch, 68, of Salem, died Monday in Silverton. He was born in Beaverton, Township, Minn., and moved to the Salem area in 1975 from Garden Grove, Calif. He was a caretaker in a group home. He enjoyed coin collecting and crafts. His wife, Rebecca, died in 1987. Survivors include his daughter, Sharon LaBorde of Hayward, Calif.; and sisters, Mary Kliner of Euclid, Minn., and Elizabeth Wentz of Shady Cove. "Rebecca C. Scharosch, 70, of Salem, died Wednesday. She was born in Hettinger, N.D. She was a psychiatric technician in Calif-ornia before moving to Salem in the early 1970s. She was a member of Holy Cross Lutheran Church, Salem. Survivors include her husband, Herbert J.; daughter Sharon LaBorde of San Jose, Calif.; sisters Doris Peterson and Mary Davidson, both of Hettinger; and brother Otto Muller of Cape Coral, Fla.
Services will begin at 1 p.m. Saturday in Barrick mortuary, Salem. Private interment will be in Lee Mission Cemetery, Salem. Visiting will be from noon to 8 p.m. Friday at the mortuary. 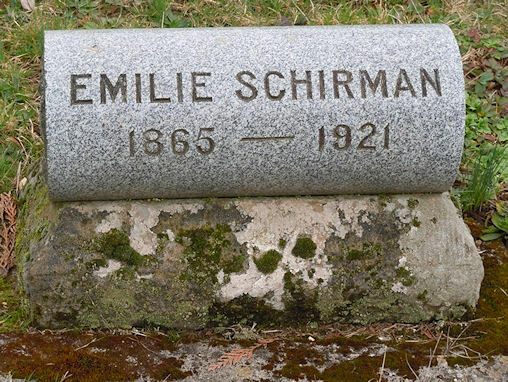 "Schirman--At her residence, two miles south of Turner, August 10, 1921, Emile E., wife of Fred Schirman, at the age of 56 years. Besides her husband she leaves nine children, Mrs. Fred. Lehman of Suver, Or; Katie Schirman, Alvin Schirman of Portland; Daniel of Salem and Walter, Samuel, George, John and Richard, who are living at home, and one sister, Mrs. Martha Urbigkeit in Annaheim, Cal., and Mrs. Marie Rahlke of Salem. "Memorial services will be at 3:30 p.m. Friday in the First United Metho-dist Church for Dr. L.B. Schmidt, 83, of Salem, who died Sunday. Private interment will be in Lee Mission Cemetery, under direction of Virgil T. Golden mortuary. He was born in Russellville, Mo., and began work in a dental laboratory at age 12. He graduated in 1926 from the North Pacific College of Dentis-try, Portland. He began dental practice in Salem after graduation, and completed a degree at Willamette University in 1941. He joined the Army Reserve Officers Association and was called into active duty in World War II, serving in both the Aleutian and European theaters. He returned in private practice in Salem and again was called up for the Korean War, rising to the rank of lieutenant colonel. He retired as a career officer from the U.S. Army Dental Corps in 1960. In the early 1960s, he served as a dentist for the Oregon State Correc-tional Institution and the Oregon State Tuberculosis Hospital. Since 1965, he had been in private practice in Salem. Surviving are his wife, Elsie Lippold Schmidt, Salem; daughter, Jane Olsen, Beaverton; and stepdaughter, Edna Marie Natkin, Seattle. "Dionicia T. Schneider, 69, of Salem died Sunday. and moved to Salem in 1981 from Los Angeles. She is survived by her sisters, Nenita S. Lance of Molalla, Arsenia S. Villareal of Salem and Malucina S. Alagao of Hawaii. "Schultz--At her home, 1427 N. ? street, Friday, January 28. Serena M. Schultz, wife of B.F. Schultz at the age of 40 years. "Pastor's Wife Passes--Mrs. Schunke, Well Known and Respected Woman, Is Dead--Mrs. Frederike Schunke, wife of Rev. G. Schunke, pastor of the German Baptist church, died at her home, 925 north Cottage street, early yesterday morning. She was 65 years of age. Funeral services will be held from the German Baptist church this afternoon at 2 o'clock. The burial will take place in Lee Mission cemetery. Mrs. Schunke had been ill only a very short time. About a week ago she experienced a severe paralytic stroke which left her in a weakened condition. Each day her condition grew worse until yesterday when she passed away after intense suffering. Of devout religious beliefs, womanly, with a deep love and devotion for the members of her family and her hosts of friends, Mrs. Schunke grad-ually won for herself a warm niche in the hearts of practically all of the members of the parish of which her husband is pastor. Unselfish, unfailing in the time of need, she was loved and respected by all who came in contact with her. She had been connected with the German Baptist church since a child. "Frank Schutz Dies Friday; Rites Tuesday--Funeral services for Frank S. Schutz, 71, long time Salem drugless physician, who died Friday at his home, 1030 N. 17th street, will be held Tuesday, at 3 p.m. from the Clough Barrick chapel. The Revs. George Chapman and Kenneth Wishart will officiate. Schutz was born in Osceola county, Iowa, in 1873 and after residing in Wisconsin for several years, came to Salem in 1914. In 1917 he began his practice as a drugless physician which he continued until failing health forced his retirement. He had been seriously ill for the past nine months. Survivors include the widow, Mrs. Mary Schutz and five sisters, Mrs. W.A. Gueffroy of Salem; Mrs. F.A. Shisler of Naperville, Ill.; Mrs. Anna Bohner of Scotland, S. Dak. 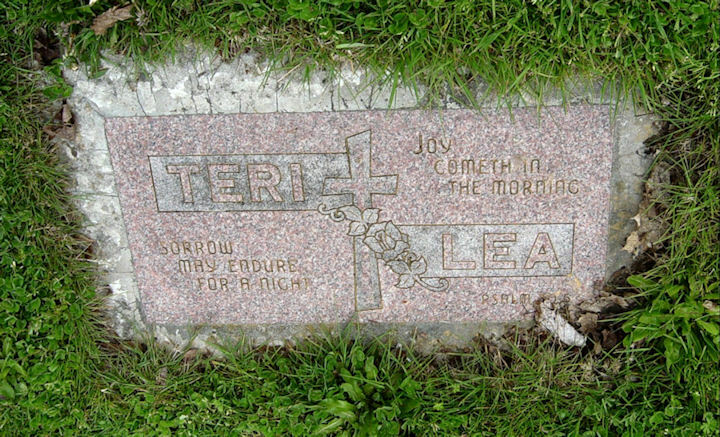 ; Mrs. Lena Brown of Rosthern, Sask., Canada. ; and Mrs. Nettie Jahn of Moscow, Idaho., and two brothers, Albert Schutz of Anaheim, Calif., and Elmer Schutz of Joliet, Ill.
"Mrs. Mary Cook Schutz, a resident of Salem for 55 years, died at a Salem nursing home Tuesday at age of 91. Born near Lime Springs in Iowa, she was married to Frank Schutz at Evansville, Wis., in 1905. The couple came to Salem in 1908. Her husband died in 1944. She was a member of the Weslyan Methodist Church here. Survivors include a cousin, Luther D. Cook, Salem. SALEM - Our dear child, Marcus, came into this world fighting for his life. He fought courageously for six years and when he was called to leave us, he left bravely and without complaint. His genuine kindness, compassion, whole-hearted laughter, and love will always be an example of a life well-lived. ‘Marky’ loved all things mechanical. He was a wizard with a pair of pliers and a screwdriver. Anything that made him self-mobile was his great joy. He loved animals, food, and the color blue. He worked hard at whatever he could do for a small allowance, then spent his ‘dollars’ with amazing wisdom. He loved church and had the firm faith of a child. Thank you, Marcus, for the gift of your life. Thank you for the light, the color, the magic, and all the love you brought to us. We miss you. Goodnight, ‘Little Man.’ SCOTT, T.G. Survivors include his mother and father, Jennifer and Raymond Scott of Salem; brothers, Dale Busby of Keizer and Raymond Scott of Salem; grandmothers, Linda Thomas of Salem and Linda Riggs of Keizer; brother and sister-in-law, David and Christeana Scott of Mt. Angel; sisters, Charlotte Scott and Kandice Scott, both of Mt. Angel; uncles, Eric Burnham of Pendleton, Correy Busby of Keizer, and Mark Scott of Silverton; and aunt, Becky McKinley of Silverton. "Mrs. Seales Rites Saturday--Funeral services for Mrs. Nora Seales, who died Tuesday, will be held Saturday at 10 a.m. in the W.T. Rigdon Chapel. Mrs. Seales was born in Whitman City, Wash., on April 4, 1879. She grew up and went to school there and in 1914 married Clarence A. Seales. They moved to Independence, Ore., and stayed until 1924 when they came to Salem. Mrs. Seales was a member of the Christian Science Church. "Sechler--At the home of her daughter, Mrs. J.A. Wright, 303 North Third street, Saturday, Oct. 27, 1917, Mrs. Miranda Sechler, 71 years old. Mrs. Sechler is survived by four children, four grandchildren and a great grandchild. Her children are Mrs. J.A. Wright and H.M. Sechler of Salem and Mrs. Nettie S. Tallman of Guthrie, Okla., who were at her bedside, and Mrs. Robert Rubeck of Thunder Hawk, S.D. "Woodburn--Amanda Seethoff, 83, a native of North Dakota and a resident here since 1937, died in a Woodburn convalescent home Monday morning following a long illness. She came to Oregon in 1912 and resided in Monitor and Salem before moving to Woodburn. Her late husband John was a minister in the United Methodist Church. Surviving are sons Menno E. Seethoff, Canby, Norman K. Seethoff, Bellevue, Wash., Dennis M. Seethoff, Fort Worth, Texas, and Cordes H. Seethoff, Salem; sister Mrs. Fred Schroeder, Woodburn, and two sisters and three brothers in North Dakota; 16 grandchildren and eight great-grandchildren. "Auguste Sefers, 98, 332 24th St. NE, died Friday at her residence. A native of Latvia, she lived in Salem since 1950. Surviving are daughters Mrs. Maija Teikmanis and Mrs. Skaidrite Lezdins, both of Salem; sons Ojars and Margers Sefers, both of Salem, and Laimonis Sefers; five grandchildren and four great-grandchildren. "Salem, John George Shamberger was born May 30, 1923 to John J. and Lizzie (Smith) Shamberger in Oroville, WA. He died peacefully March 8, 2016 at the age of 92 with family by his side. 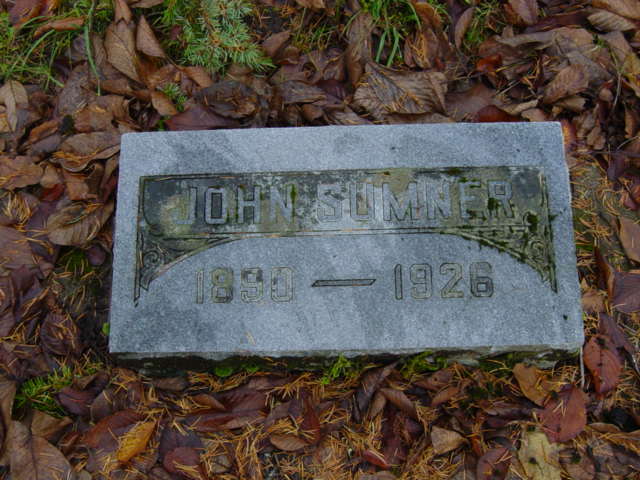 When John was four years old his family moved to a farm near Sublimity. He attended Rock Point grade school. In 1937 the family moved to the Fruitland community East of Salem. He finished the eighth grade at Fruitland grade school. In 1944 he was drafted into the Army and served in several locations in the Pacific. He was in the Army Occupation in Japan. In 1946 he received his honorary discharge, came home and bought a farm in the Fruitland community, which along with some additional property he still owned at the time of his passing. On July 3, 1948 he married Betty White of Jefferson, OR. Together they raised their 7 children on the farm. John is survived by his wife of 67 years Betty and Sons; John Michael (Harriett), Thomas E. (Diana), Steven L. (Jennifer), Benjamin A. (Lori) and Daughters; Elizabeth A. Miller (Edwin), Carolee S. Will (Kenneth) and Laura M. Dornbusch (Kelly). He is survived by his brother Gene Shamberger, 20 grandchildren and 22 great-grandchildren. "Mrs. Sharpe Succumbs to Long Illness--Mrs. Clara Sharpe, 1032 Elm St. NW, died Tuesday at her home at the age of 73. She had been ill for some time. Born at Locust Grove, Ohio, Mrs. Sharpe came to Oregon from Kansas in 1929 and lived at Dallas for two years, before coming to Salem. 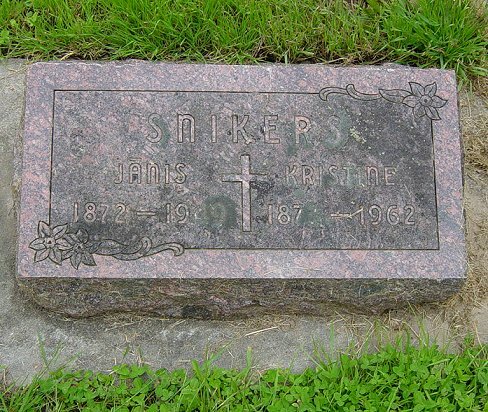 Her husband, Robert Hamilton Sharpe, a farmer in Kansas and a carpenter here, died in 1949. Mrs. Sharpe was a practical nurse at Salem Memorial Hospital for several years in the 1930s. She was a member of First Christian Church. 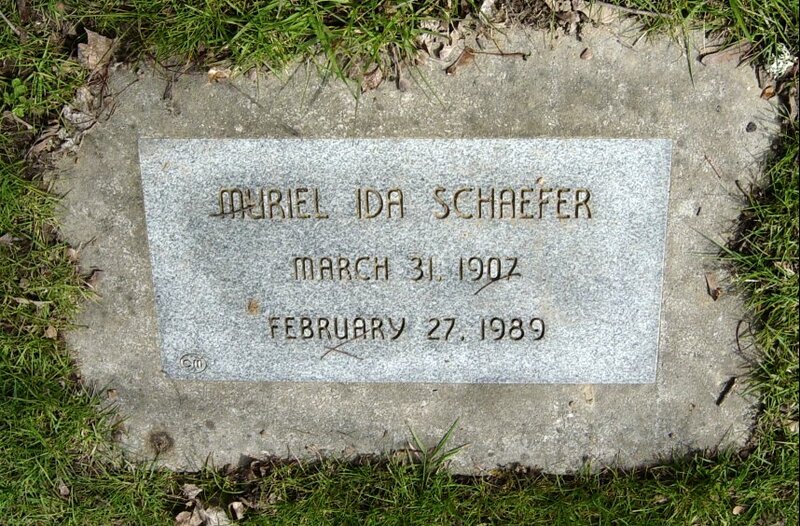 She leaves two daughters, Mrs. Marcella Middleton, Sweet Home, and Mrs. Frieda McCarthy, Salem; three sons, Willard, Ralph and Carroll Sharpe, all of Salem; three sisters, Mrs. Dicy Penn, Pasadena, Calif., Mrs. Agnes Nicely, Dayton, Ohio, and Mrs. Pauline Boyd, Germantown, Ohio; four grandchildren and eight great-grandchildren. "Francis Willard Sharpe, 67, Rt. 1, Box 827, died Monday in a Dallas nursing home after a long illness. Sharpe was born in Bluffton, Ind. He moved to Salem around 1925 and was a cannery worker before his retirement. He is survived by widow Mildred; brothers Caroll, Salem and Ralph, Turner; sister Marcella Middleton, Sweet Home. "Traffic Victim Was Middle Grove Student--James Sharpe, 11, of 4707 Silverton Road NE, who was killed instantly Sunday night when his bicycle collided with a car, was born in Salem and attended the fourth grade at Middle Grove School. He was the son of Mr. and Mrs. Carroll C. Sharpe. Sharpe is a custodian at the Capitol Building here. The victim was riding his bike toward home after a trip to Middle Grove Market, about one-quarter of a mile from the crash scene in the 4600 block of Silverton Road NE. He was riding in the right-hand lane of the road heading east when a passing car driven by Roy Rutschman, 47, of Silverton, collided with the bike. Pieces of the bike were scattered along residential yards. Police pointed out that the bike wasn't equipped with a light. Rutschman said the boy was `directly in front of me when I slammed on the brakes.' The impact sent the boy crashing into the car's fender and windshield. His body came to rest in a ditch alongside the road. "Christie Faye Sheffield, 56, of 4385 Battlecreek Road SE, died Tuesday at Salem Hospital Memorial Unit. Born in Cleo, Okla., she came to Salem in 1957 from Independence. She was a past chief and current deputy district grand chief of Willamette Temple 45, Pythian Sisters, Indepen-dence. Survivors include her husband, Billy D.; daughters, Sherrie Morrow, Salem, and Landa Sharlie Babb, Dallas; sons, Leslie Dane, Monmouth, and Jerry, Sandy; brother, Elmar Cousin, Lamont, Wash.; sister, Virginia Bergman, Salem; 19 grandchildren. "Sheneman--At the Salem hospital, May 19, 1914, Alive B. Sheneman, aged 29 years. Returned east c1843 because of her second husbands ill health. He died there shortly thereafter. "Lewis Shepherd Dies; Former Salem Resident--Lewis Shepherd, 67, a former Salem resident who had lived in Silverton for the past few months, died Sunday at a Salem hospital. Shepherd, a plasterer by trade, has not been active since suffering a stroke about six years ago. Born July 20, 1883, in Kansas, Shepherd came to Washington about 1905. He was married in Washington 34 years ago this month to Bernice Russell, who survives in Silverton. Other survivors include three brothers, Charles Shepherd, Port Angeles, Wash.; Isiah Shepherd, Richfield, Wash.; and John Shepherd; a sister, Mrs. W.I. Richards, Salem; and 20 nieces and nephews. "Salem Hermit Is Dead--Lifeless Body of David Shepardson Found in Home--Laying fully dressed, face downward, upon his bed in his meagerly furnished home in Morningside, David Shepardson, aged 85, was found dead by neighbors yesterday morning. The deceased was something of a hermit, living alone in the house he purchased several years ago. He was a frequent visitor at the home of neighbors and friends, where he `peddled' milk, and delivered butter and eggs. It is the belief of Coroner Clough, who was called to investigate the case, that the aged man died sometime during the day, Thursday. The cause of his sudden passing was heart failure, according to this authority. A brother of the deceased, who is believed to reside in Riverton, Neb., has been notified and no disposition of the remains will be made until a reply is received from the east. 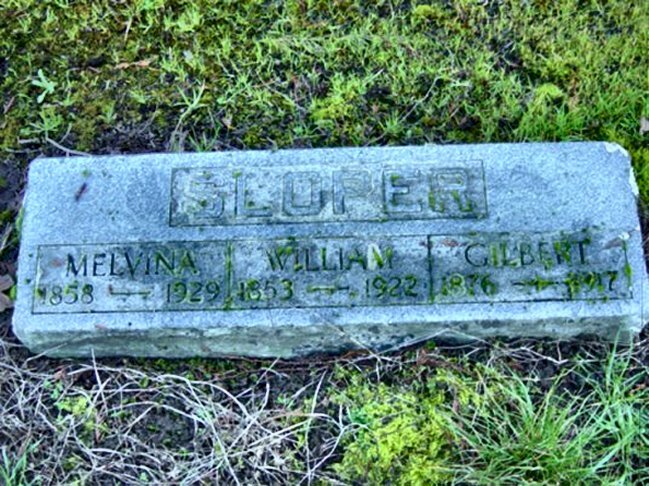 "Sherer--In Salem, January 28, 1918, William F. Sherer, 41 years old. "Died--Sherman--In this city on Saturday, March 26, 1892, the infant of Mr. and Mrs. D.C. Sherman. "Sherwood---At her home, 463 South Commercial street, Tuesday morning, December 24, 1912, at 9:45, Mrs. Catherine Elizabeth Sherwood, aged 73 years. The funeral services will be held at the W.C.T.U. hall, Thursday at 2:30 p.m. Burial will be in the Lee Mission cemetery. "Sherwood--At the home of his parents, in North Salem, Monday, July 13th, 1885, of paralysis, Daniel Sherwood, aged about twenty-one years. "D.H. Sherwood Dead--Suddenly Prostrated While Working At His Home--And Before Medical Aid Could Reach Him His Spirit Had Taken Its Flight---Daniel H. Sherwood, aged 67 years, died quite suddenly at his home in North Salem at 4:30 o'clock yesterday afternoon. At 3 o'clock he was working as usual around his house, being engaged in making a violin, when he became ill and was prostrated suddenly. A messenger was sent to Salem for a physician, who went to his bedside only to find that his condition was a hopeless one, death coming at the time above stated. Mr. Sherwood was born near Berna-dotte, Fulton county, Illinois, in 1828, when there were few but Indians in that now rich and populous region. He remained there all his early years and until 1871. At the outbreak of the war of the rebellion he enlisted in Co. G, 11th Illinois Cavalry, Colonel Robert G. Ingersoll being his commanding officer, but he served only a short time when he was honorably discharged on account of hemorrhage of the bowels, from which he suffered continually at intervals until his death. He was married in 1854 to Catherine Elizabeth Fosselman, who is now a heart stricken mourner by the bier of her companion of over 40 years. To them were born three children, only one of whom is now living, Gideon F., who is salesman at Gilbert & Patterson's grocery store. In 1871 the family came to Oregon, living a short time in Linn county, but they have been respected residents of Salem over twenty years. He has been a good man and citizen and the family have sincere sympathy in their deep sorrow. While his old ailment had caused him great suffering at times, yet his death was unexpected. At 3 o'clock he was taken ill and at 4:30 he said "good-bye" to those around him and passed over in answer to the myster-ious roll-call. He was prostrated suddenly and suffered intensely through several spasms. "Former Pastor To Be Buried Today--Dr. Edwin Sherwood, Prominent Biblical Teacher Passes Away--Dr. Edwin Sher-wood, who for the past 12 years has held the chair of Biblical interpreta-tion at Kimball School of Theology, passed away at his home in this city, Sunday at the age of 53 years, death coming as the result of exhaustion from over work. He had been ill but a few days before his death. Funeral services for Dr. Sherwood have been arranged for this afternoon at 2:30 from the First Methodist church. Rev. Blaine E. Kirkpatrick will be in charge of the services. Friends who desire to see the body may do so before 1 o'clock at the Rigdon chapel. A wife, Mrs. Elizabeth Sherwood, two sons and two daughters survive the deceased. William Sherwood is a senior at Willamette University and Paul Sherwood a junior in the same institution. Mrs. Edith Sherwood Mason of Mill City and Grace Sherwood, a teacher in the public schools of Redmond, Ore., are the daughters who survive. Dr. Sherwood's father was William Sherwood M.D., a physician in Cincinnati and a professor in the Electric College of Medicine, of which institution he later became president. His father died when Edwin Sherwood was but three years old and his brother, James Sherwood, superintendent of the Cincinnati schools for may years, was his guardian. He entered Ohio Wesleyan university at the age of 16 years and received his AB degree from there in 1890. The following year he took a master's degree. In 1913 he was given his D.D. from his Alma Mater. After leaving Ohio Wesleyan Mr. Sherwood went to Drew Theological seminary in Madison, N.J., from where he received his degree in 1894. He received a foreign fellowship while in the seminary and went to Leipsic, Germany as a student for one year. Upon his return to Ohio Dr. Sherwood joined the Ohio conference, being a classmate of Dr. Carl Gregg Doney, president of Willamette university, in conference. The two men stood side by side when ordained and have retained a fast friendship ever since that time. "Mrs. Sherwood Dies Monday--Elizabeth Ellen Sherwood, widow of the late Rev. Edwin Sherwood who was for many years on the faculty of Kimball School of Theology, died late Monday at her home, 707 1/2 Cross street. The Sherwoods resided in Salem from 1906 to 1909 when Rev. Sherwood was a professor at Willamette university before he accepted the post at Kimball, where he remained until his death in 1921. Surviving children are Edith Sherwood Mason of Mill City, Rev. James Paul Sherwood of La Haima, TH., and Mrs. Grace Fleming of Springfield, Ill. Another son, William Sherwood who was a veteran of World war I, died several years ago. "G.F. Sherwood is Called by Death--G.F. Sherwood, resident of Salem for over 50 years, died at a local hospital Saturday at 12:40 o'clock, aged 73. His home has been at 463 South Commercial street. He is survived by his widow, Mrs. Hattie Sherwood. Funeral services will be conducted at the Clough-Huston chapel at 10:30 o'clock Monday. 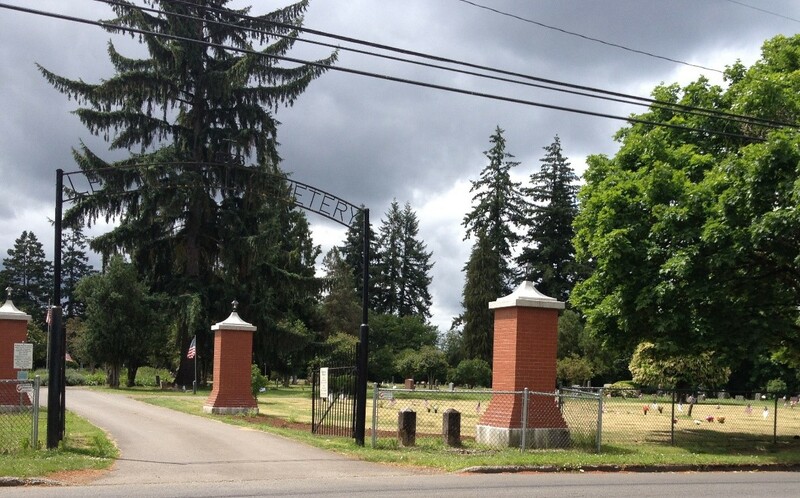 Lotcy has two cemetery markers; one with first husband Gideon F. Sherwood and second as Lotcy B. Rinehart. Lotcy B. Sherwood m'd William N. Rinehart 22 May 1934 per Marion Co. marriage record #19635. See obit at Lotcy B. Rinehart. "Schuster--At the Salem hospital, Saturday, October 14, 1911, H.S. Schuster, aged about 80 years, of senile exhaustion. He was born in New Jersey, where he became a young man of great promise. 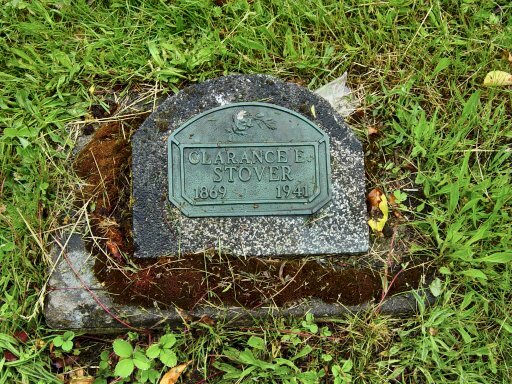 He came to Oregon in the `seventies,' locating at Astoria, and later came to Salem where he flourished for years as a photographer, but, like many others, was allured into mining and expended his financial and physical strength and returned to Salem a wreck. Only a few friends knew him, and the life of one has gone out whose early life was one of the fairest and whose associations were with the best people in the community. He rated as one of the best educators in New York. He will be buried in Lee Mission cemetery. The date of the funeral is not decided. The body is at Lehman & Clough's undertaking parlors. "Mrs. C. Shurs Is Called By Death--Former Minnesota Resident Passes Away at Age of 87 Years--Mrs. Catherine Shurs died at her home on rural route 9, Monday, June 23 at the age of 87 years. She has been a resident of Oregon for 20 years coming here from Minnesota. She is survived by four daughters and one son; Mrs. J.L. Gordon of St. Paul, Minn., Mrs. Frank Ayers of St. Paul, Minn., Mrs. John Peterson of Salem, Mrs. E. Dover of Sleepy Eye, Minn., and Harry Shurs of Stockton. She is also survived by 14 grandchildren, 8 great grandchildren and two great-great-grandchildren. "Arvid Sidlovskis, 89, of Salem died Saturday. 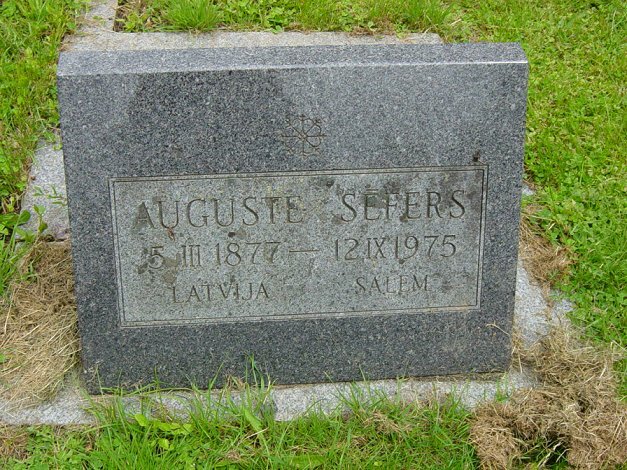 A native of Latvia, he moved to the United States in 1943 and to Salem in 1946. 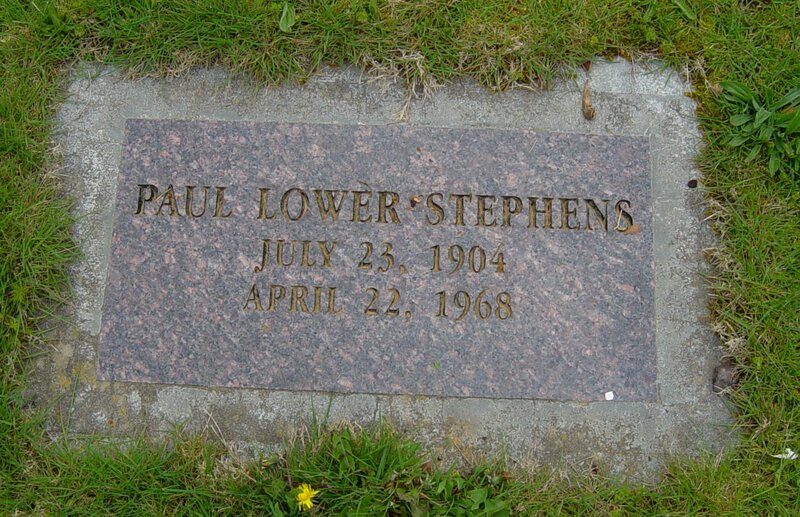 He was an accountant for the Oregon State Penitentiary for 30 years. Survivors include his wife, Lillie. 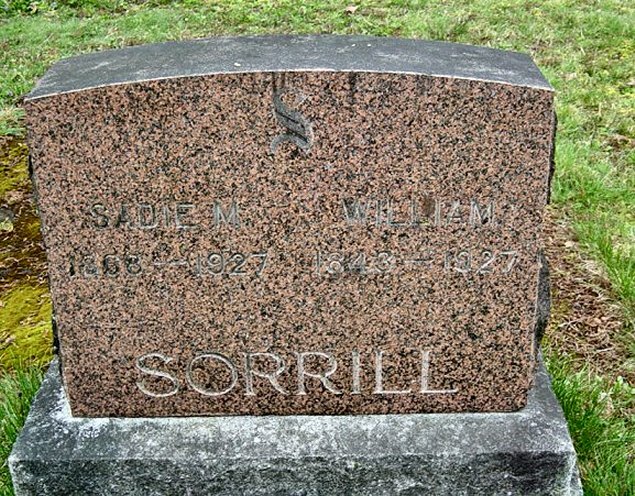 "Liebi--In the city of Salem, Sunday, May 5, 1912, Emil Liebi, 60 years of age. "D.A. 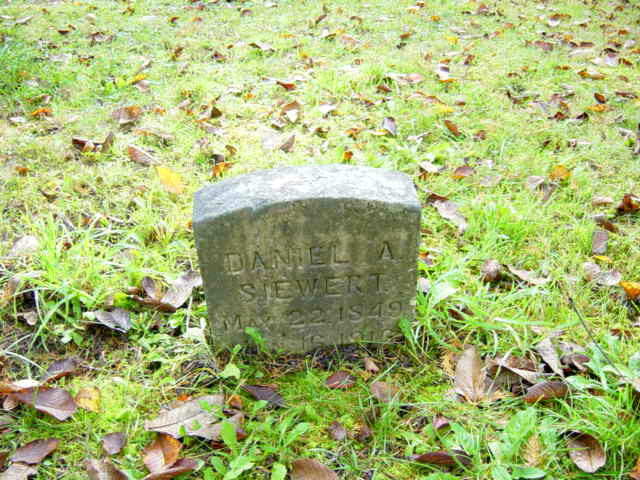 Siewert Is Dead--Native of Germany Had Lived In Salem for Many Years--D.A. Siewert, a resident of Oregon since 1877 died Sunday at his late residence, 2090 Ferry street, at the age of 67 years. The family moved to Salem five years ago from their farm, four miles south of Salem, where they had settled upon coming to Oregon. Mr. Siewert was a native of Germany, having lived in this country since he was 14 years old. He was married to Caroline Otto at Waukesha, Wis., in 1873. Besides his widow, who is an invalid, he leaves a large family of grown children. The children are: Rev. S.A. Siewert, Denver, Colo.; Hulda L. Siewert, Port-land; Albert A. Siewert, Salem; Mrs. L.H. Schultz, Portland; E.C. Siewert, Los Angeles; Dr. A.D. Siewert, Pasa-dena, Cal. ; F.J. Siewert, Dallas; Mrs. D.E. Cooper, Salem; Lena M. Siewert, Salem. "Edward T. Silva, 78, of Salem died Saturday. He was born in Lemoore, Calif., and had lived in Salem since 1988. He married Doris Pepper on March 15, 1959, in Vancouver, Wash.
Before retiring, he had worked as a truck driver for United Grocers. He had been a member of the Teamsters union for more than 30 years. Survivors include his wife; eight children; brother, Tony of San Francisco; and numerous grandchildren and great grandchildren. Graveside services will begin at 2 p.m. Wednesday in the Lee Mission Cemetery. Arrangements are by Virgil T. Golden mortuary. "Daniel B. Simpson, 81, died unexpectedly Saturday at his Salem home, 1550 Norway St. NE. A resident of the area since 1907, Simpson was born in Wisconsin. He was superintendent of Salem's street car system for many years, and later owned Nob Hill Motel in South Salem until his retirement 11 years ago. Simpson was a member of First Christian Church here for 58 years. He and his wife, Jennie L., observed their 63rd wedding anniversary Tuesday. Survivors in addition to the widow include sons Col. Garold I. Simpson and Garlen L. Simpson, both Salem; sisters in Wisconsin and Wyoming; three grandchildren and one great-grandchild. "Simpson--At the home of its grand-parents, Nebraska avenue and Twentieth street, April 9, 1910, Gaylord Simpson, son of Mr. and Mrs. D.B. Simpson, aged 1 year and 5 days. "Mrs. Jennie Lucira Simpson, 80, a late resident of the Methodist Home, Salem, died Wednesday at her home. A native of Maple valley, Wis., she moved to Salem in 1907. She was a member of First Christian Church here for 66 years. Survivors include sons, Garlend L. and Col. Garold I. Simpson, both Salem; three grandchildren and three great-grandchildren. "Walter Raymond Simpson, 60, 812 20th St. NE, a resident of Salem since 1948, died at a Salem hospital Tuesday after an illness of three years. He was a bricklayer. Surviving are widow Jeanette, Salem; sons James with the Air Force at Hamilton Air Base, Calif., and John, Portland; sisters Mrs. Beulah Free, Klamath Falls; Mrs. Eva Davis, Superior, Ariz., Mrs. Margaret Severson, Phoenix, Ariz., and Mrs. Elizabeth Tevebaugh, San Francisco, Calif.; two grandchildren. 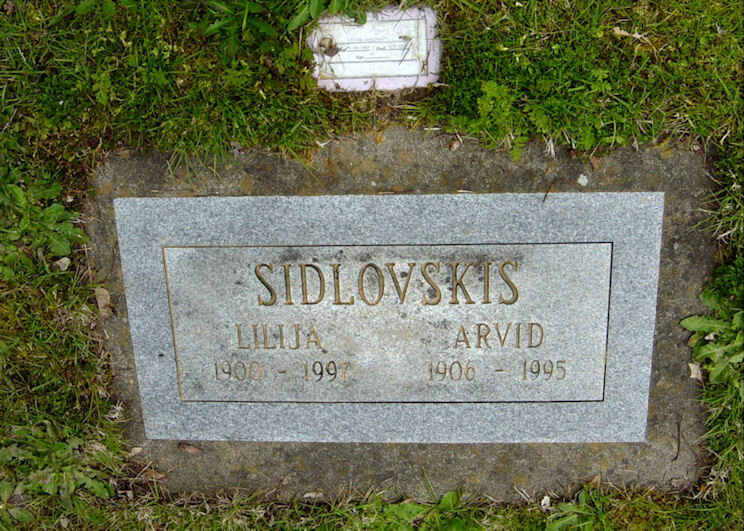 "Mr. Fred Sittkus died at the home of his daughter, Mrs. J.H. Cook, Thursday, January 5, 1905, of an apoplexy stroke. He was born in Eastern Prussia May 1, 1820, and was married in 1846. In 1860, with his wife, he came to the United States. In 1898 they came to Salem, where they have been with their daughter, Mrs. Cook. "Death Claims Mrs. Skeen At 79 Years--Mrs. Delia Cordelia Skeen of Donald, a one time Salem resident, died Saturday in Portland at the home of a daughter. She was 79. Mrs. Skeen operated a Linotype for The Statesman at the turn of the century. She was born in Missouri on August 5, 1877, a daughter of Mr. and Mrs. W.W. Walker, and came to Oregon with her parents at the age of 10. For about seven years she worked for The Statesman's mechanical department. In 1905 she married Henry Goode, a Washington grade school principal. Later, they operated a grocery in Multnomah County. He died in 1933. She moved to Salem and later married Frank E. Skeen, in this city. They lived in Monmouth. Skeen died a year and a half ago. She moved to her son's home at Donald, where she lived until several weeks ago when she visited her daughter in Portland, Mrs. Skeen suffered from a heart condition. Survivors are a son, Henry of Donald; two daughters, Mrs. Floyd Hamman of Salem, and Mrs. S.H. Raz of Portland; two sisters, Mrs. Minnie Sperry and Mrs. Nona Clark, both of Salem; and 10 grandchildren. "Clackamas--Elsie Louise Skelton, 72, formerly of Salem, died Sunday in Clackamas. A Washington native, she was a homemaker. Her hobbies included crocheting afghans and canning. Survivors include her husband, George; sons Frank Edward of Tigard; Robert Duane of Pittsburg, Calif., Harold Joseph of Sandy, Gary Thomas of Woodburn; stepdaughter, Audrey May Kauffman of Baker City; 11 grandchildren, and three great-grandchildren. "CLACKAMAS - George T. Skelton, 83, former Salem resident, died Thursday. Born in Marshfield, Ore, he grew up in Salem and graduated from Salem High School. Served in the US Navy during World War II. He had a farm in the Canby area and worked at Crown Zellerbach, retiring in 1980. He moved to Clackamas in 1988. Enjoyed airplanes, embroidery, fishing and tutoring 2nd graders at Elwelling Elementary School in Milwaukie. He is survived by his sons, Frank Skelton of Tigard, Robert Skelton of Pittsburg, Calif., Harold Skelton of Sandy and Gary Skelton of Woodburn; daughter, Audrey Kaufman of Baker City; brother, Ernest Skelton of Calif.; Sister, Ella Skelton of Salem; Sixteen grandchildren; and four great-grandchildren. George was preceded in death by his wife, Elsie. Contributions may be made to the Alzheimer’s Assoc. "Skinner--At the home of H.A. Skinner, in West Salem, at 12 o'clock noon, Thursday, March 12, 1895. Cornelia Skinner, aged 72 years, 9 months and 2 days. Deceased was the wife of Robert L. Skinner, an old and well-known resident of that portion of Polk county. About one year ago she was stricken with consumption which was the direct cause of her demise. Mrs. Skinner's childhood days were spent in Canada and afterwards she became a resident of Indiana. Twenty-three years ago she came to Oregon where the remainder of her life was passed. "Skinner--At his home in West Salem, Sunday, March 11, 1900, at 10 a.m. of consumption, Hiram Alonzo Skinner, aged 53 years, 10 months and 3 days. Deceased is a native of Canada, coming to Oregon about twenty-five years ago. He was the son of R.L. Skinner, who died several months ago. He is survived by his wife and one daughter, Mrs. James Edgar. The deceased held membership in Valley Lodge No. 18, A.O.U.W. of this city and leaves $2000 for his wife. 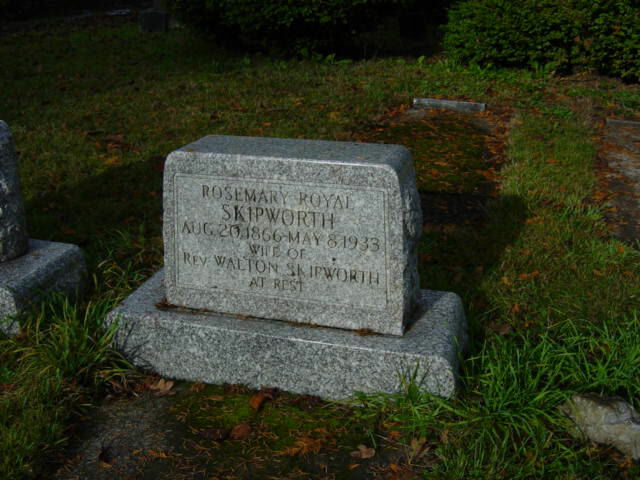 "Mrs. Skipworth Is To Be Buried Here--Mrs. Rosemary Skipworth, 66, wife of the Rev. Walton Skipworth, retired Methodist Episcopal minister, died here Monday. 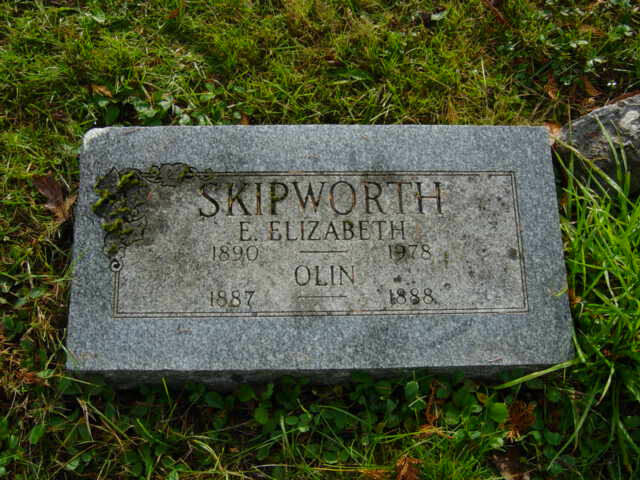 Mrs. Skipworth, a native of Oregon, was married to the Rev. Skipworth at Salem September 3, 1885. They made their first home together in the parsonage of the Methodist Episcopal church in the capital city. Mrs. Skipworth worked for 43 years with her husband in his active ministry. "Skubel--At his home, 1362 North Sixteenth street, July 15, 1917, John Skubel, age 73 years. "Edna B. Sloan, 88, of 4380 Auburn Road NE, died Tuesday in Salem Hospi-tal Memorial Unit. Born in Tacoma, she came here as an infant and graduated from Oregon Normal College in Monmouth. 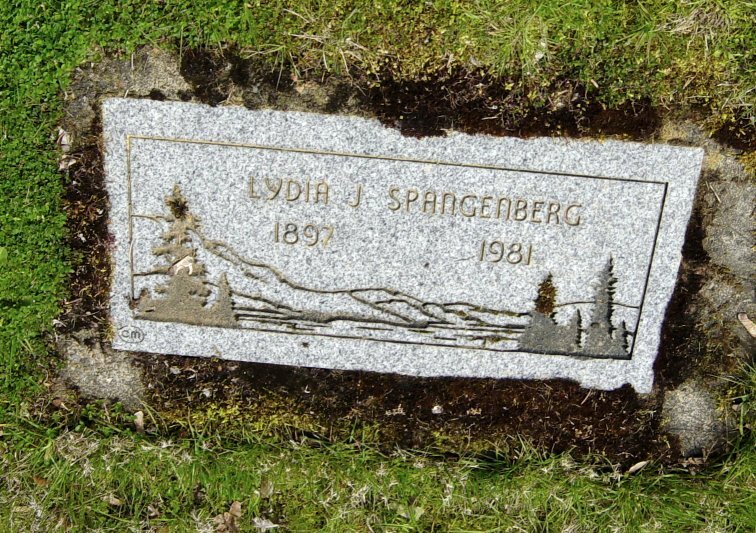 She was a retired schoolteacher, having taught in Eagle Creek, Condon, Wilhoit Springs, Salem and Molalla. She was a foster mother for more than 200 children, and was a member of the Central Seventh-day Adventist Church. Surviving are her daughter, Lulu L. Stauffer, Fairbanks, Alaska; stepsons, Byron Hurd, California, and Wayne Torson, Salem; nine grandchildren, 15 great-grandchildren, a niece and two nephews. "Sloper--At the residence of his parents, 1085 North Cottage street, Tuesday, October 31, 1916, A. Gilbert Sloper, in his 40th year. Mr. Sloper came here about a month ago from Salt Creek, Oregon, and has been visiting his parents, Mr. and Mrs. W. H. Sloper. He is survived by his parents, a four-year-old son, a sister, Mrs. Lillie Lofton of Waterloo, Oregon, and two brothers, Ross Sloper of Fresno, Cal., and Leon Sloper of Salem. 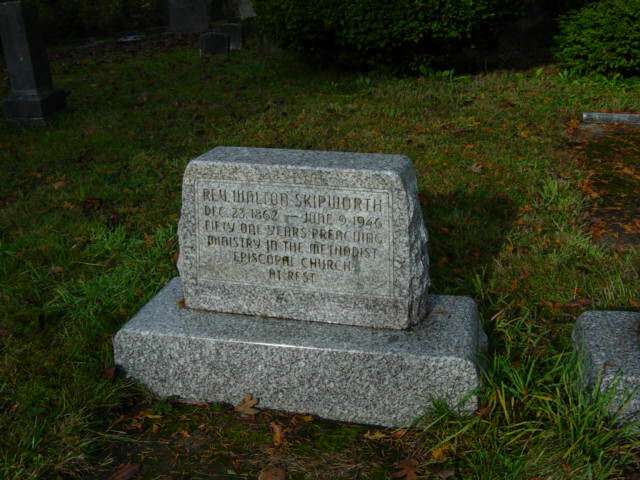 "Melvina Sloper Is Called By Death --Melvina Barbara Sloper, widow of the late William H. Sloper, who died in Salem in 1923, passed away early Friday morning in Lebanon at the home of her daughter, Mrs. Lillie L. Loftin, where she had been visiting the past month. She was 71 years old. She was ill but a short time. She had made her home most of the past six months, or since she gave up housekeeping, with her son, L.L. Sloper of West Salem. 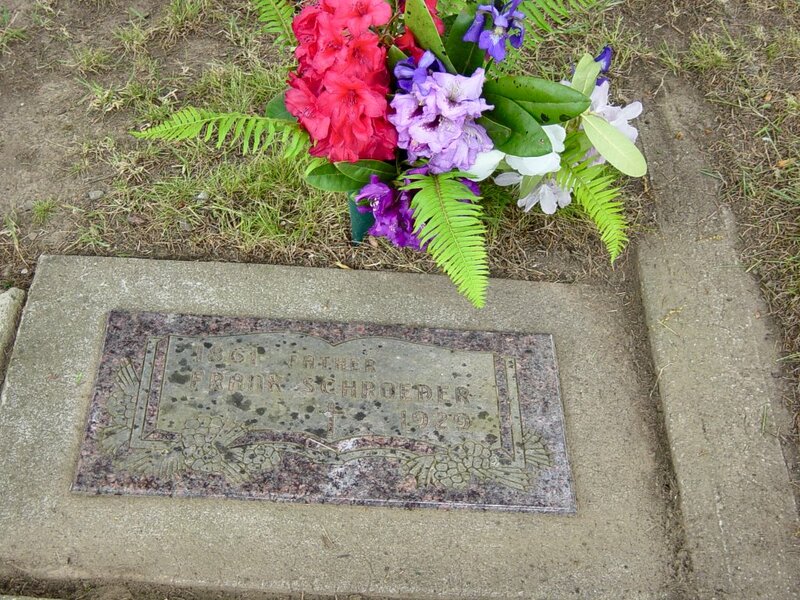 Melvina Barbara Hart, daughter of William J. and Martha Hart, was born in Tipton, Cedar county, Iowa, June 16, 1858. 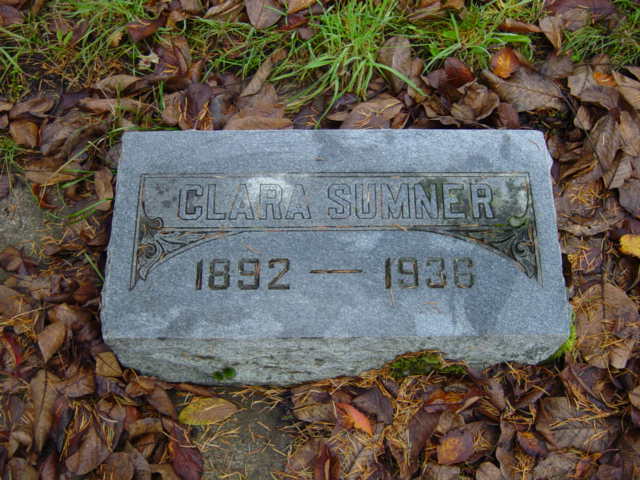 She was married to William H. Sloper some time before coming to Oregon in July, 1879. The family settled at Independence, where they lived for eight or ten years. They came to Salem 20 years ago and she had lived here continuously since that time. Mr. Sloper followed the painter's trade here for many years. Mrs. Sloper was a member of the Christian church and also of the Women's Benefit association, belonging to the latter 38 years. Funeral services will be held at 1 o'clock this afternoon at the Rigdon mortuary chapel, Rev. D.J. Howe officiating. The Women's Benefit association will conduct brief graveside services at the Lee Mission cemetery where interment will be made. "Sloper--William Sloper died at a local hospital Sunday evening at the age of 69 years. He leaves his widow Mrs. Melvina Sloper. Two sons Leon L., of Waterloo, Ore. Ross of Fresno, Cal. Asleep in Jesus. Blessed sleep from which none ever woke to weep. 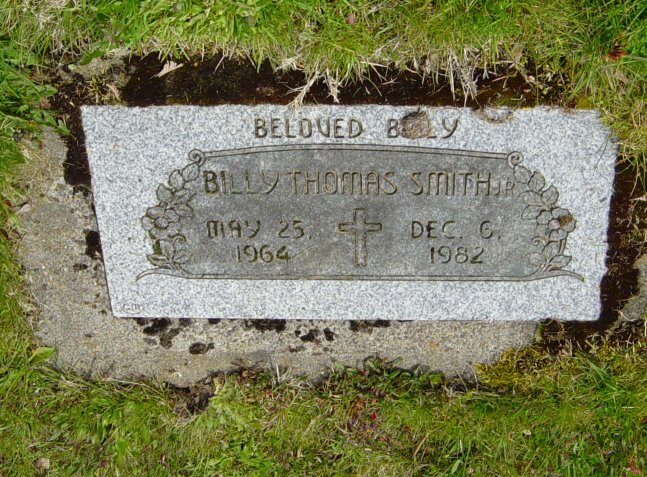 "Bert Smith Killed By S.P. Train--Was Unconscious When Picked Up Sunday Morning And How The Accident Happened Will Never Be Known--A young man named Bert S. Smith, a race horse attache at the fair grounds, who was picked up along the Southern Pacific tracks near the grounds Sunday morning, in an unconscious and apparently dying condition, died later in the day at the Salem hospital, and the remains are being held at Rigdon's undertaking parlors awaiting instruction for disposition from relatives in Nebraska. "Billy Thomas Smith, Jr., 18, of 4847 Jean St. NE, died Monday in a vehicle accident. Born in Los Angeles, he came here in 1969, and attended North Salem High School. Survivors include his parents, Virginia Hetland, Salem, and father Billy Thomas Smith Sr., Detroit, Mich.; brothers, Stephen Bowen, New Orleans, and Sterling Hetland, Manassas, Va.; and sisters, DeLyle Robbins, Imperial, Mo., and Kimberly Edwards, Eugene. Services will be at 1:30 p.m. Friday at Howell-Edwards-Doerksen mortuary. "Smith--At his late home, 535 North Nineteenth street, Tuesday, May 30, 1916, Clarence J. Smith, aged 64 years. 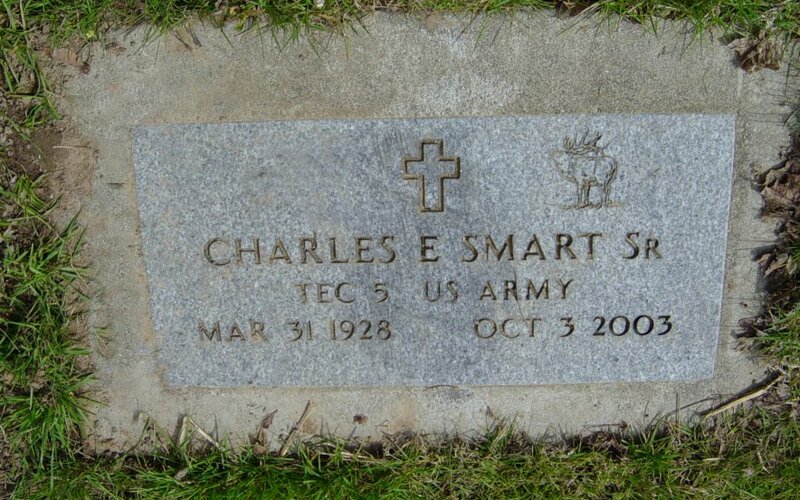 Besides his widow he is survived by a son, Walter E. Smith, and a brother, Charles Smith, of Portland. He had made his home in Salem for ten years. "Dale A. Smith, 61, of Salem died Friday. He was born in Bandon. He was the manager of the state Motor Safety Enforcement Section. He was a Korean War Marine Corps veteran and a member of the Masonic Lodge and Shriners. He is survived by his wife, Kathleen, who he married on Feb. 17, 1973, in Reno, Nev.; daughter, Connie Isaacson of Hillsboro; stepdaughter, Debra J. White of Portland; son, David H. Smith of Fort Grant, Ariz.; step-son, Mark W. Wilson of Portland; and four grandchildren. "Smith--At the family home, north-east corner of State and 25th streets, Salem, February 13, 1897, at 6 a.m., Floyd, son of Mr. and Mrs. Frank Smith, in his 8th year. The cause of his death was membraneous croup. The funeral will be held at 1:30 p.m. today at the residence and the remains will be buried in Lee Mission cemetery, conveyed thence by cars at 1:45 o'clock. "Frank Smith, aged 72 years. Survived by widow, Mary, and the following children: Mrs. Edna Ludkins, Mrs. W.A. Sampson and Fred W. Smith of Salem. Funeral services Thursday at 1:30 p.m. from chapel of W.T. Rigdon & Co. Interment Lee Mission cemetery." OS Feb 19, 1936 3:1 s/o G.A. & Rebecca (Sanders) Smith per D/C #158; Brantley Seigel Calhoun, born February 19, 1862 at Wolf Creek, Wright County, Missouri. He married Mary Wilson. 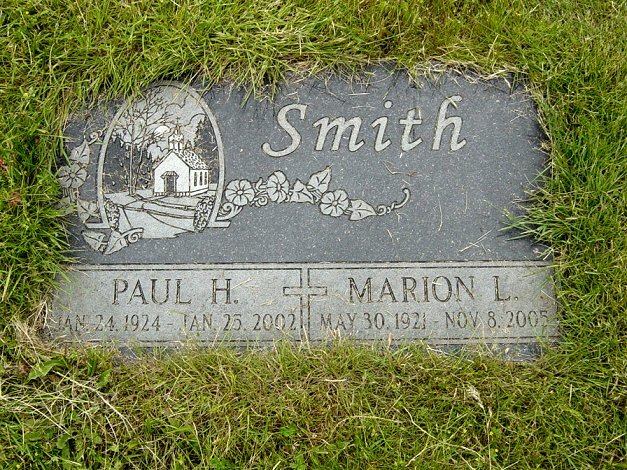 The name he took and is buried under at Jason Lee is Frank Smith. Mary is buried with him. His death date was February 17, 1936. His youngest son, Fred W. Smith, started the Watercolor Society of Oregon and one of his paintings is in the Salem Civic Center. "Geo. 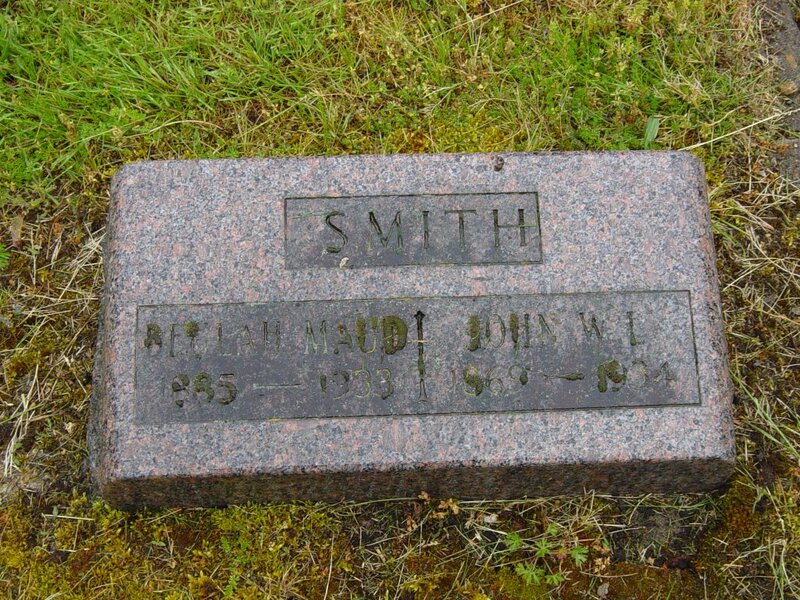 W. Smith, Pioneer, Dead--Came to Oregon in 1846--Passes Away After Short Illness.--Crossed Plains by Ox Team From Missouri--Long a Resident of Polk County--Funeral to Be Held Tomorrow Afternoon.--George W. Smith, a pioneer Oregonian, died yesterday afternoon at 4:25 o'clock at the Willamette sanatorium, following a short illness. He was 73 years old. He is survived by a widow, seven sons and two daughters. In 1846, with his parents, Mr. Smith crossed the plains by ox team from Missouri, settling at Luckiamute, near Dallas, where he lived until he was 26 years old. 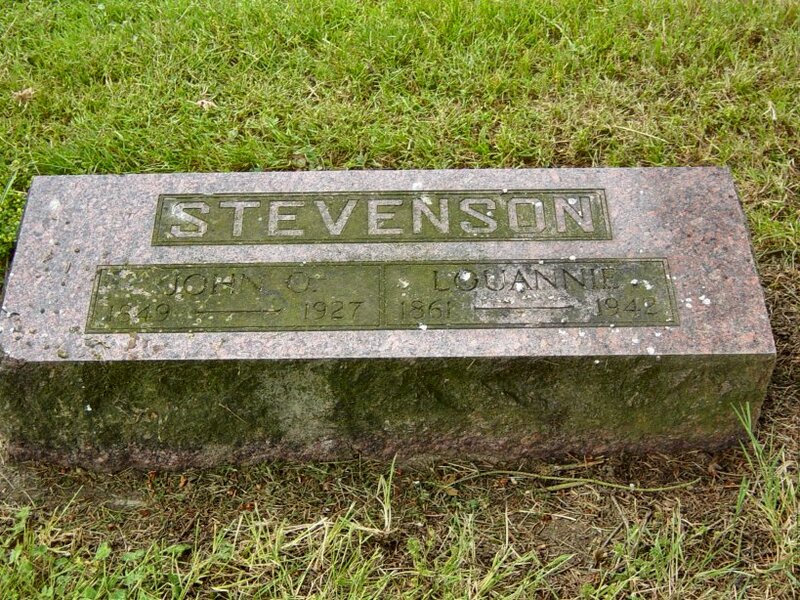 He was married May 10, 1886, at Luckiamute to Miss Nancy E. Sheldon. Later he moved to Colfax, Wash., where he lived for thirty years. He was engaged in farming. In 1904 Mr. Smith returned to Oregon, making his home at Hood River and The Dalles until last July, when he moved to Salem and has been living at 1640 Hall street. The children who survive him are: Silas M. Smith and Herbert S. Smith, Penawawa, Wash.; George T. Smith, Almonto, Wash.; Chauncey Curtis Smith, Spokane; Elmer O. Smith, Salem; Clyde T. Smith, The Dalles; Dorsey O. Smith, Boring; Mrs. A.C. Smith, Endicott, Wash., and Mrs. H.P. Allen, Hood River. "Gertrude L. Smith, 70, of 1770 Childs Ave. NE, died Thursday. Born in Rochester, Minn., she came to Oregon in 1921 and Salem in 1977. She was a member of Eastern Star. Survivors include husband, Thomas, and son, Dale A., Salem. "Former Salem Man Passes at Stayton --Henry Smith, a former resident of Salem, passed away at Stayton yester-day morning. Funeral services will be held Wednesday at 1 o'clock from the Free Methodist church here. "Portland--Jane Elizabeth Keith Smith, 78, formerly of Salem, died Wednesday. A native Oregonian, she was born in Albany and graduated from Salem High School. She was a switchboard operator and homemaker. She was a member of St. Paul's Episcopal Church in Portland. 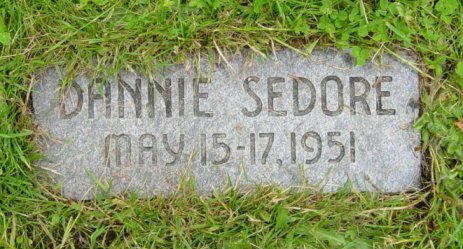 Her husband, Theodore, died 1986. Survivors include her sons, David of Salt Lake City, and Don of Reno, Nev.; daughter, Gehla Knight of Portland; sister, Priscilla Anderson of Florida; six grandchildren, and four great grandchildren. "Smith--At the Oregon Hospital for the Insane, Salem, Or., Friday, March 20, 1901, Joseph E. Smith, aged 64 years, of semi-paresis. Mr. Smith stands high in the Masonic order, being a 32d degree Scottish Rite Mason and a Knight Templar; and also in the Knights of Pythias. His son, Robert Smith, arrived from Port-land, and took the body to Portland for burial. "Smith--At Dunsmuir, Cal., M.C. Smith, age 28 years, of acute gastritis. "Thomas D. Smith, 83, of Salem died Monday in Salem. He was born in Mayfield, Mich. He grew up and lived in Bandon before coming to Salem in 1977. 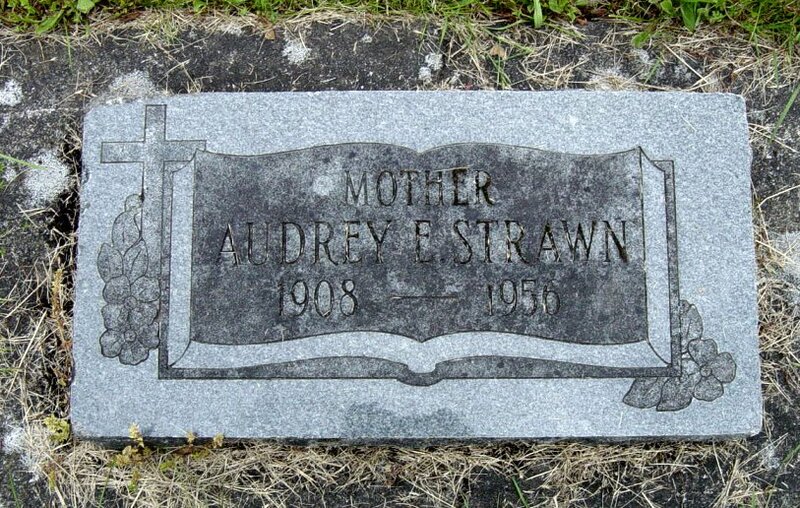 He married Gertrude L. Fellows June 4, 1928, in Bandon. She died in 1982. He was a life member of the Bandon Masonic Lodge for 56 years. Survivors include his son, Dale of Salem; and sisters, Eva Gilmore of Bandon and Evelyn Finley and Ardith DeGrote, both of Coquille. "Mrs. Kristina Snikers, 89, died Monday at the home, 2225 Chemeketa St. NE. Mrs. Snikers was born in Latvia and came to Salem from that country 13 years ago. Her husband, Janis, died in 1940 in Germany. She was a member of the Latvian Church in Portland. Surviving is a daughter, Mrs. Martha Shaefers, Salem, and one granddaughter. 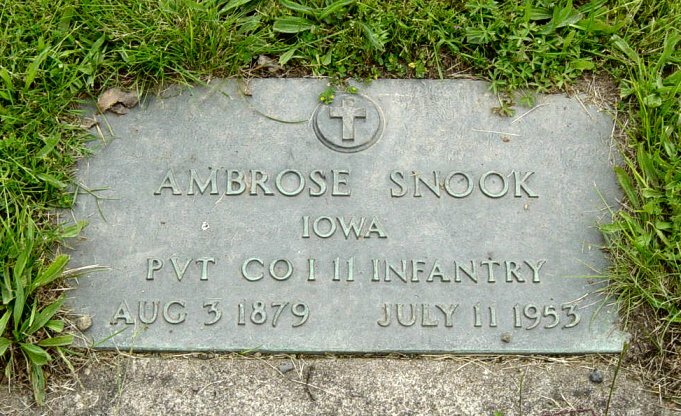 "Final Rites for Ambrose Snook Set Wednesday--Ambrose Snook, late resident of 2185 N. Liberty St. who died Sunday at Roseburg, had lived in Salem since 1922. He was a veteran of the Spanish-American War and had been ill for some time at the veterans hospital in Roseburg. 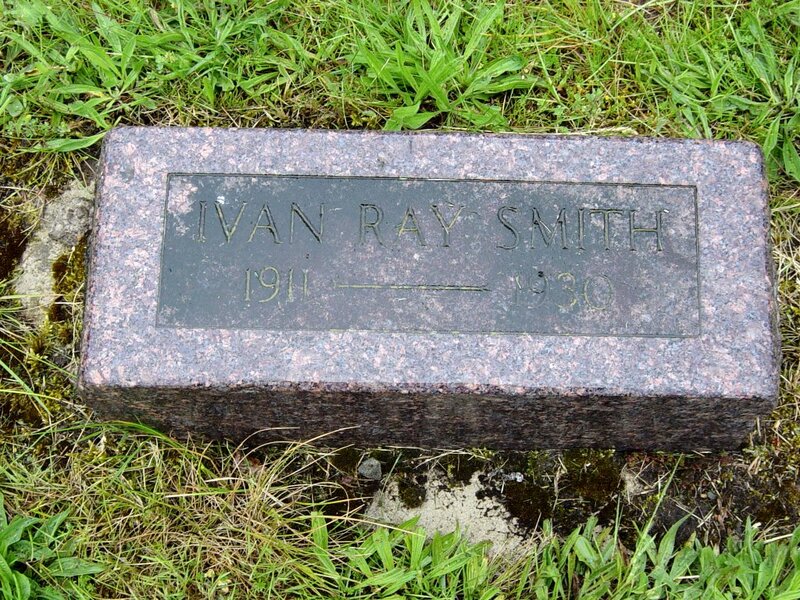 He was born in Iowa Aug 3, 1879, and lived for several years in Wyoming. Funeral services will be held Wed-nesday at 3 p.m. in the W.T. Rigdon Chapel, with interment at Lee Mission Cemetery. "Virgil B. Snow Services Set On Thursday--Funeral services for Virgil B. Snow, Willamette University alumnus who died Sunday in Portland, will be held on Thursday in Piedmont Friends Church, Portland. Burial will be in Lee Mission cemetery, Salem, at 12:30 Thursday. Snow was an Oregon native who grew up in Portland. A lifelong member of Friends Church, he was employed by the Post Office Department in Portland for 30 years and also worked for the Bureau of Public Roads as a civil engineer. 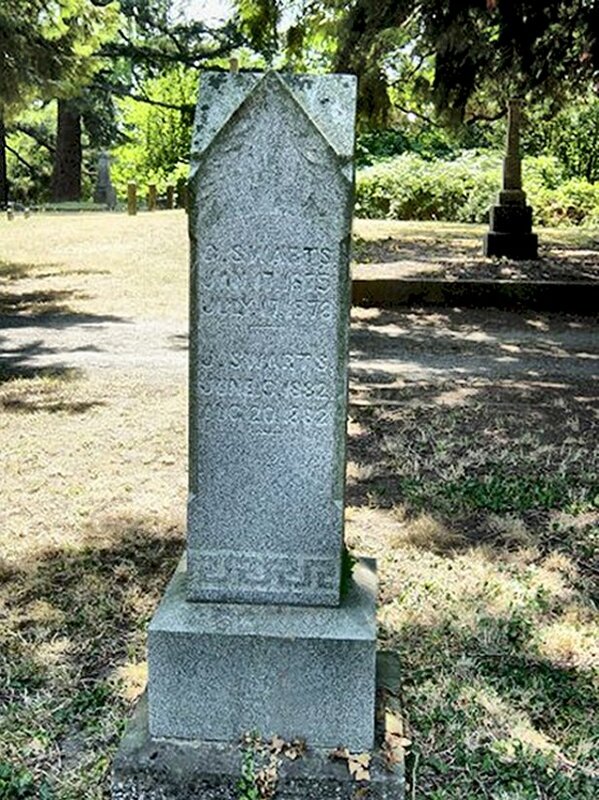 "Passing of Aged Pioneer--Conrad Snowden Dies As A Result of Severe Fall and Exposure--Came From Kentucky to Oregon In The Year 1852--Discoverer of Snowden Springs In Douglas County--The Funeral Services. After an illness of several days, due to a heavy fall and long exposure to the rough weather as a result, Conrad Snowden, an aged and highly respected resident of this city, died at his home, No. 323 Mill street, at 10:40 o'clock yesterday morning, aged 80 years 11 months and 5 days. Deceased was an old pioneer of Oregon. he was born in Shelbyville, Kentucky, on January 15, 1821, and was married to Miss Rachel Graves in St. Joseph, Missouri, in 1852. In the year 1851 he and his young bride crossed the plains and settled in Douglas county, where in 1871, he discovered and named the famous Snowden Springs and erected a large and splendidly appointed hotel upon the site. In 1872 he disposed of this property and removed to salem where he has lived continuously since in the enjoyment of the greatest respect a community could bestow upon a mortal being. Although he was a member of no church or organization, he has always led an upright and honorable life and his good deeds upon this earth will remain fresh in the memory of all who knew him. His beloved wife preceded him to the Great Unknown on January 30, 1893 and his marriage was blessed with two children, one of which, Mrs. R. Heimroth of this city, survives him, and the other, Mrs. Isadore Rice, died January 13, 1891. A foster child, Mrs. Roy E. King, nee Lena Stanfield, also survives him, whose marriage, which took place at the bedside of Mr. Snowden on Saturday evening last, marks one of the most pathetic incidents of the good old gentleman's life in that it was brought about through his special request. Deceased also leaves one brother, W.P. Snowden, who resides in Omaha, Nebraska, where he is engaged in business. "Snowden--At her home in this city, corner Chemeketa and Cottage streets, Friday afternoon, January 20, 1893, from dropsy, Mrs. C. Snowden, aged 60 years, 2 months and 7 days. Mrs. Snowden was born in Tennessee and came to Oregon in `53, settling in Douglas county. In 1880 she removed with her husband to Salem, where she has made her home since. "Lydia G. Spangenberg, 83, of 4480 Market St. NE, died yesterday at St. Francis Nursing Home. Born in Milaca, Minn., she came here in 1963. She was a homemaker. Survivors include her daughters, Irene Busch, Maplewood, Minn., Renee LaBarre, Bloomington, Minn., and Mercedes Manders, St. Paul, Minn.; sister, Anita Hamley, of Florida; nine grandchildren and 10 great-grandchildren. Seeking to save his brothers life, he gave his own. Our loved ones. "Drowns With Sons--Mrs. Frank H. Spaulding and Two Boys Lost--Rescue Efforts In Vain--Mother Goes to Aid of Elder Boy, Who Is Seized With Cramps While in Lake, and All Three Are Drowned--Spokane, Wash., Aug. 1.--(Special)--While struggling frantically in the waters of Lake Kelso to save her two sons from drowning, Mrs. Frank H. Spaulding, wife of Rev. Mr. Spaulding, Sunday school missionary of the Columbia River conference of the Methodist Episcopal Church, today drowned with her loved ones. The Spaulding family have been camped for the Summer on the shores of Lake Kelso, one and a half miles from Granite, and the two boys, aged 9 and 14 years, while frolicing on the sandy beach, ventured into the water and got beyond their depth. The older boy was taken with cramps and cried to his mother for aid. The mother plunged into the cold waters to rescue him, and when the cries of the drowning boy reached the little fellow a fit took hold of him and he sank beneath the surface. The bodies have been recovered, according to latest information here. "Rev. Spaulding Passes at Vale--Rev. Frank R. Spaulding, an early circuit rider and Methodist minister, died Wednesday evening at the age of 81 years, at Vale, Oregon. He was the father of Bruce Spaulding, Polk county district attorney. Rev. Spaulding had been active until the time of his death. He was born January 11, 1862, in Monticello, Wash., the son of a pioneer circuit rider. He entered the Methodist ministry following his grad-uation from Willamette university in 1880, and during his lifetime also served pastorates in South America. His father at one time taught at Willamette university. His wife, the former Catherine MacDonald, was drowned in an accident in 1909. To the couple were born 11 children, nine of whom are living. The children include, R.T. Spaulding of St. Helens, Earl Spaulding of Hood River, Frank Spaulding of Odessa, Texas, Olin Spaulding of Arlington, Oregon, David Spaulding of Santa Monica, Calif., Mrs. Mary Fletcher of Eugene, Mrs. Fay Swan of Vale, Oregon and Bruce Spaulding of Dallas. He is also survived by 12 grandchildren. "Died, in Salem, July 1, 1878, Mrs. Harriet Ellen Spaulding, wife of D.L. Spaulding, of Oregon conference of the M.E. Church. "SALEM - Ralph Spence was born on his parent's homestead near Roberts, Idaho. When he was two years old, his family moved by team and wagon to Missouri, where they stayed for several years before returning to Idaho. He attended school in the Boise Valley, graduating from Nampa Senior High School in 1938. He attended the Oregon College of Education in Monmouth, Oregon. He served in the U.S. Navy during WWII, serving overseas in the Pacific for more than three years. In February of 1944, Ralph married Olga Schultz. They were married for 55 years. He was employed in State Government as an engineering technician, structural, mechanical, and building inspector, retiring in 1979. Ralph was an inducted member of the Grand Chapter of Royal Arch Masons. He spoke fluent Spanish and taught many Spanish-speaking families English, making many friends in the Spanish community. Ralph was a wonderful and caring neighbor. He started the neighborhood watch on his block, always keeping a close eye on his neighbor's homes when they were away on vacation. He is survived by several nieces and nephews. He will be dearly missed by his nieces, nephews, close friends, and the staff at Southern Hills Assisted Living, where he resided for the last three years. He will be remembered for his great sense of humor, his positive, upbeat attitude, and the fact that he never had an unkind word to say about anyone. Contributions may be made to the Union Gospel Mission. Memorial Serivces will be 2:30 p.m. Friday, September 7th at Virgil T. Golden Funeral Service." 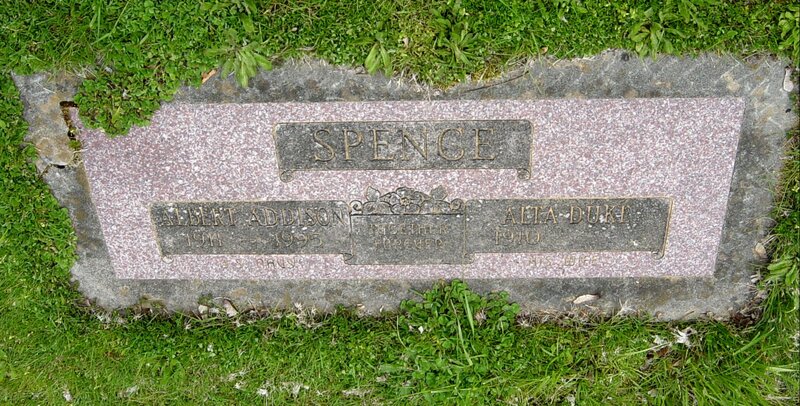 "Sperling--In Salem, Oregon, Febru-ary 16, 1911, William Sperling, aged 46 years. "Spicer--At her home just over the river in Polk county, Saturday evening, November 11, 1893, from consumption of the stomach, Mrs. W.E. Spicer, aged 22 years. "Spoor--At the family home, 592 North Summer street, Friday, December 20, 1907, at 11 p.m., Chas. 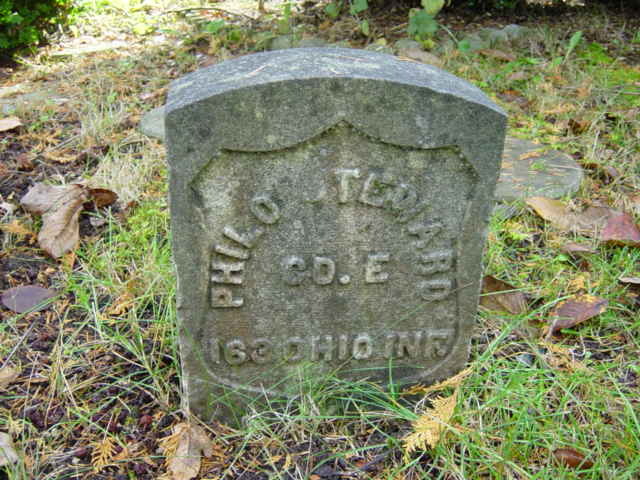 L. Spoor, aged 15 years, of typhoid. "Spoor--At the Old People's home, July 4, 1913, Louisa Duyler Spoor, aged about 56 years. The funeral will be held at 3 o'clock, Sunday afternoon, at the First Methodist church. The burial will take place at Lee Mission cemetery. Rev. R.N. Avison will officiate. Louise Duyler Spoor was born in Purple Grove, Ontario, Canada, in 1852. She was married in Fargo, North Dakota, December 27, 1887, to Rev. William Minnis Spoor, a Methodist minister of the North Dakota confer-ence. She and her husband moved from Dakota to the state of Washington in 1900, in May 1907, Rev. Spoor died and Mrs. Spoor with her two children, Charles and Ruth, came to Salem the following September. Three months after the son entered Willamette university he was stricken with spinal meningitis and again in the same year, death invaded the family circle. On October 30, 1909, Mrs. Spoor became superintendent of the Old Peoples' home of Salem, where she remained until compelled by failing health to resign, March 1 of this year. SPOOR, William M innis Rev. 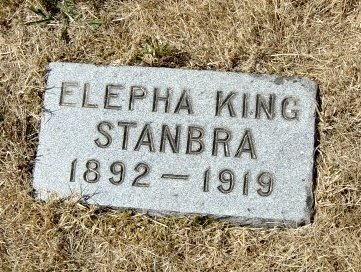 "Funeral of Mrs. Stanbra Will Be Held Here Today--The body of Mrs. Alma Elepha Stanbra, 27 years old, who died at her home at Oakland, Or., Sunday arrived in Salem last night and at 11 o’clock this morning the burial will take place in the Lee Mission cemetery and short services by Rev. A.S. Mulligan will be held at the grave. "Standish--At the home of her sister, Mrs. R.E. Thompson, No. 216 Ferry street, Salem, Oregon, Saturday December 15, 1900, Mrs. Jennie Standish, aged 41 years and 6 months. "Mae E. Stark, 74, 425 21st St. SE, died Thursday in a Salem nursing home. A native and lifelong resident of Salem, she served for many years as secretary for the Marion County Welfare Commission. Survivors include sisters Mrs. Alice Marston, Portland, and Mrs. Etta Melson, Dallas. "At the home of her parents on D and Twelfth streets, in Englewood addition to Salem, Jessie Stege, aged 18 years. 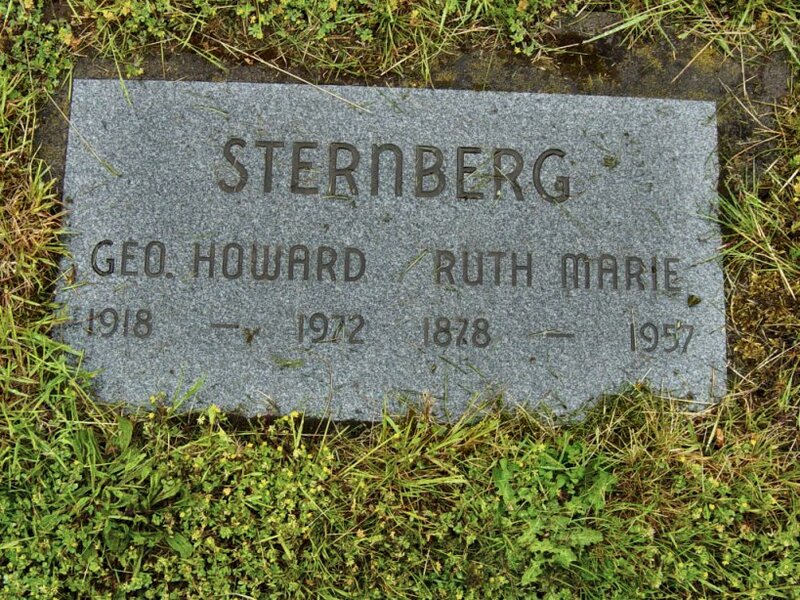 The deceased was the oldest daughter of Mr. and Mrs. E.H. Stege. Dropsy and other complications were the cause of her demise. She was a graduate of the East Salem public school. "Steinbaugh--Frank Walter Steinbaugh, aged 42 years, died at his home one half mile south of the Pringle school house at 9:30 this morning. He is survived by his wife, Lillie B. Steinbaugh, and small son, Frank Walter Steinbaugh, and two brothers now in California. STERNBERG, G eorge Albert Dr.
"Gladys Artie Steward, 87, of Salem, died Monday. She was born in Uniontown, Wash. She came to Salem in 1958. She attended St. Joseph Catholic Church and was owner-operator of a local apartment house. Survivors include her son Edgar H. of Sedro Wooley, Wash; sister Ida Mae Mathis of Klamath Falls. 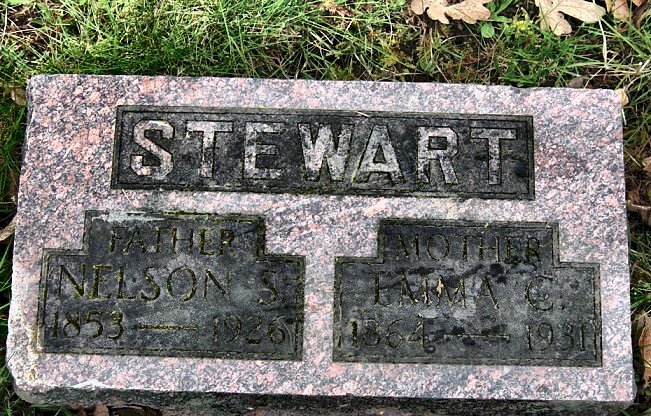 "Stewart--At the home of his mother, No. 117 1/2 Russell street, Portland, Oregon, Wednesday, May 18, 1898, at 7:50 a.m., Fred D. Stewart, aged 28 years. 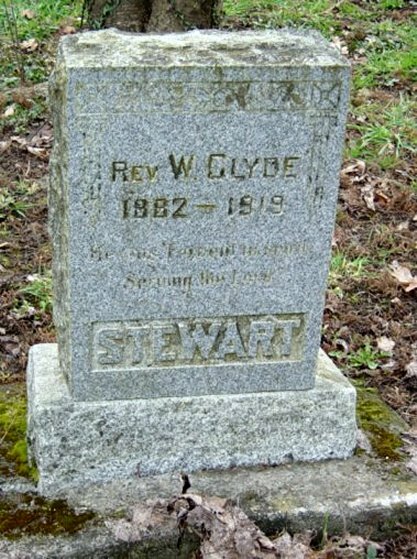 STEWART, W illiam Clyde Rev. "Mrs. Nellie Mae Stickley, 84, 4648 Silverton Road NE, died Monday in a Salem nursing home. She had lived in Salem about 12 years, moving here from Minnesota. She was a native of Iowa. She was a member of Peace Lutheran Church. Surviving are sons, Leslie and Leo Stickley, both Salem, Dale Stickley, Central City, Iowa, and Celo Stickley, Tigard, daughters, Mrs. Gwendolyn Strawn, Salem, Mrs. Velma Krow, Beaverton, and Mrs. Daisy Clary, Central City, Iowa, brothers, James Fugat, Sheridan, Wyo., and Arthur Fugat, Sioux City, Iowa, 29 grandchildren and 23 great-grandchildren. "John Stone, 81, Succumbs--John Stone, 81, a resident of the Salem area most of his life, died Friday night in a Salem nursing home. He was ill for five days. Stone, a retired farmer, was living at the home for two years. His widow, Mrs. Flora Stone, is also a resident at the home. Surviving in addition to his widow is a half-sister, Mrs. Lee Hershber-ger, Aurora. 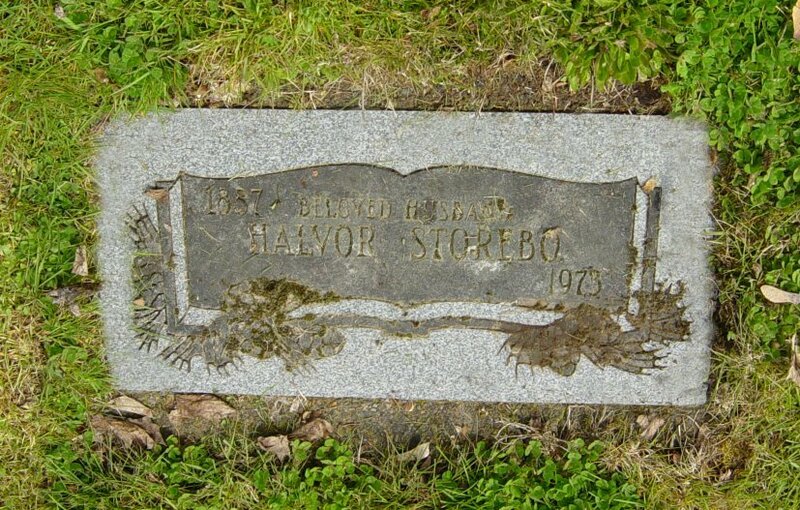 "Halvor Storebo, 85, a resident of Salem 40 years, died Saturday at his home, 940 17th St. NE. A native of Bergen, Norway, he was a retired plumber and steamfitter. He is survived by his widow Hilda. "Private interment will be at the Lee Mission Cemetery for Hilda P. Storebo, 88, of Salem who died Friday. She was born in Lakefield, Minn., and came to Salem in 1950. She owned and operated second-hand stores in Silverton and Woodburn and was a cook for the Methodist Home for several years. Survivors include her sister, Rosella E. Koska, Mason City, Iowa. "Mrs. Alice Grace Storey, 91, of 1065 Madison St. NE, died Wednesday evening in a Salem nursing home. She was born at Lindin, W. Va., and had lived here for the past 40 years. Survivors include a sister, Mrs. Amie Johnson, Salem, and two nieces, Mrs. Maxine Hurley, Portland, and Mrs. Alice Masters, Richmond, Calif. Mrs. Storey was a member of the Court Street Christian Church. "Stotlar--At the family home three miles east of Salem, Monday, January 21, 1907, Mrs. Lottie Stotlar, sister of Mrs. R.L. Swarts, aged 58 years, of pneumonia. "E.T. Stotler Services Set Wednesday--Funeral services for Elmer T. Stotler, who died at his residence 1040 Cedar Way, Sunday, will be held Wednesday at 2 p.m. in the Clough-Barrick Chapel. Interment will be at the Jason Lee Cemetery. 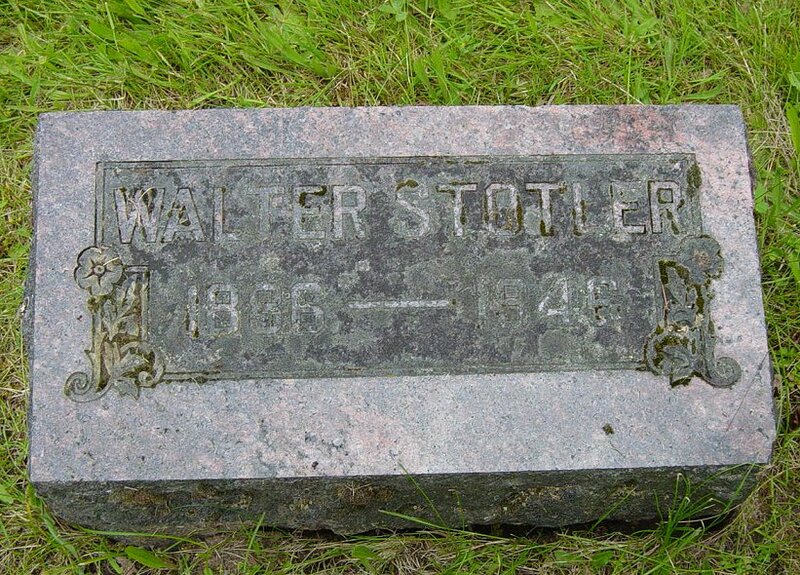 Stotler, a member of an old pioneer family, was born in Sublimity, May 14, 1878, and lived all his life in the Salem area with the exception of some years when he was in the hotel business in Sutherlin. He has been retired for many years, and was a member of the First Methodist Church. A heart attack is believed to have been the cause of his death. "Mrs. Emma Stotler, at a local hospital, March 31, at the age of 66 years. 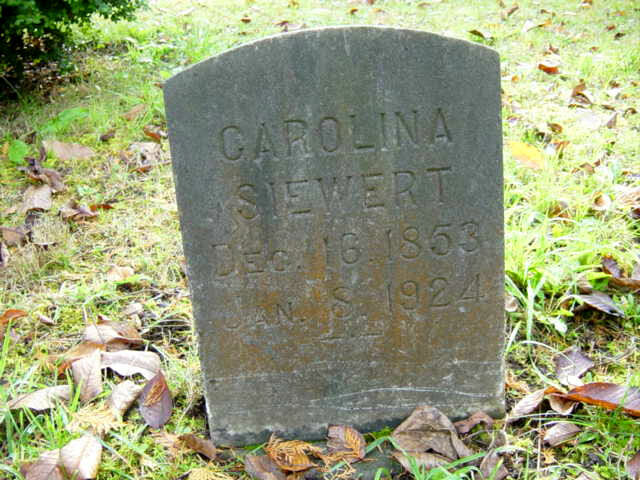 Survived by widower, Elmer Stotler, daughter, Mrs. Stella Pike, Bay City. Funeral services from chapel of Clough-Barrick company Thursday, April 2, 10:30 a.m.
STRAUSBAUGH, W illia m H.
"Death Claims Mrs. Strawn--Mrs. Audrey E. Strawn, 3855 State St., died Tuesday at home at the age of 47 after an illness of three years. Born May 25, 1908, at Spokane, Wash., she had lived at Salem for five years before moving to Oakridge five years ago. She returned to Salem about five months ago. She and Jesse Strawn were married about 1929 at Toledo. They moved from Toledo to Salem about 1946. Besides her husband, she leaves two sons, Richard Strawn, Oakridge, and Robert Strawn in the Army in Korea; daughter, Mrs. Lorna M. Wells, Salem; three brothers, Thomas J. Richards, Salem, and John and Edward Richards, both of Toledo, and sister, Mrs. Cecelia McMickle, Las Gatos, Cal. 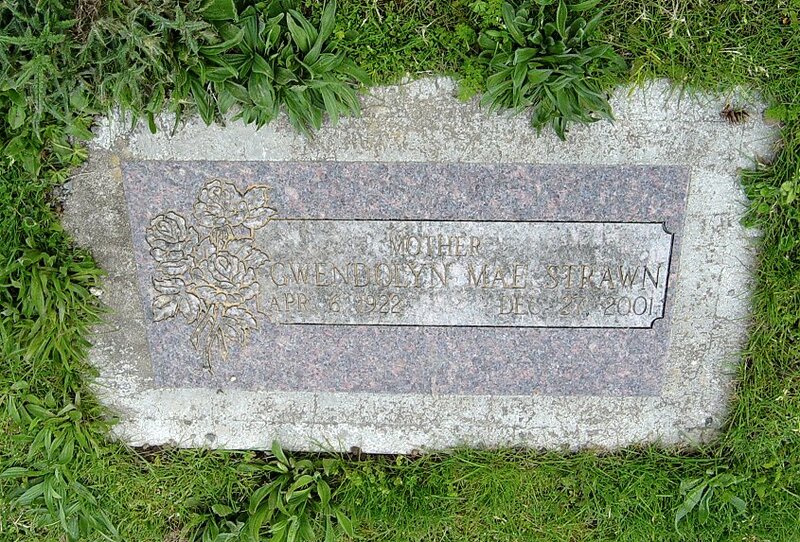 "April 04, 1922 - December 27, 2001 SALEM - Gwendolyn Mae Strawn, 79, died Thursday. She was born in Lawton, Iowa, the youngest of 10 children. 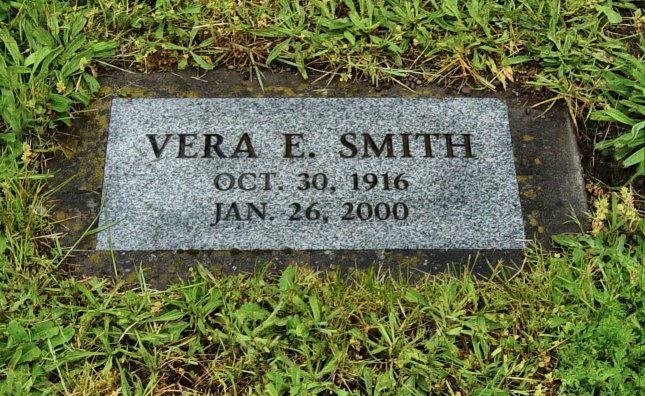 She married Melvin E. Smith in 1940 and later divorced. They had four children. Gwendolyn came to Salem in August of 1946 from Arlington, Iowa. She married Jesse Strawn in 1957. She worked as a certified nurse’s aide in the Salem area for 35 years. Her husband, Jesse, preceded her in death in 1999. Survivors include her brother, Leslie L. Stickley of Salem; daughters, Sheryl Schmidt of Tacoma, Wash., Lois Beck of Portland, Ore., Carol MacKenzie of Wasco, Ore., and Sharon Behrendt of Millsap, Texas; 12 grandchildren; 19 great-grandchildren; and many nieces and nephews. Donations may be made to Willamette Valley Hospice in Gwendolyn’s name. 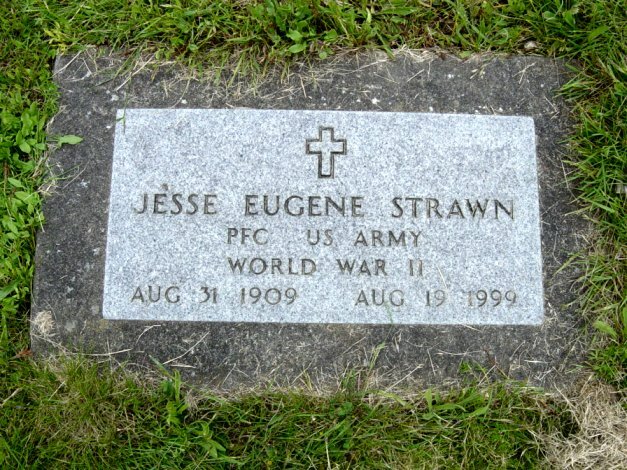 "Jesse E. 'Doc" Strawn--Aug 31, 1909-Aug 19, 1998--Jesse Strawn, 89, of Salem died Thursday. He was born in Kennewick, Wash., and served in the Army during World War II. In the 1950s he moved from Oakridge to Salem. He worked in sawmills and on a farm near Stayton. He married Audrey Richards, she died in Mar 1956. He married Mae Smith in 1957. He enjoyed gardening and yard work. Survivors include his wife, daughter, Lorna Roberts of Wenatchee, Wash.; son, Bob of Cashmere, Wash.; step-daughters, Shirley Schmidt of Tacoma, Wash., Lois Beck of Portland, Carol MacKenzie of Wasco and Sharon Fazzio of Canby; brothers, Kenneth of Salem and Fay of Aumsville; many grandchildren and great-grandchildren; and one great-great-grandchild. "Dies After Long Salem Residence--Mrs. Pherna Strong, Long Time Salemite, Called To Her Reward--After living in Salem for over half a century, Mrs. Pherna Strong passed away at her residence, 529 South Commercial street, yesterday morning at the ripe age of 83 years. Mrs. Strong died of paralysis, of which she had been a sufferer for several weeks. Her demise is greatly mourned by a large circle of friends in Salem and elsewhere. Mrs. Strong was born in Camden, Mo., July 9, 1829, and was married to her first husband, David Bain, in 1845, who accompanied her to Oregon in 1852. They settled in Salem where Mr. Bain died shortly after arriving. In 1854 she was married to Elisha Strong, who died in 1889. Mrs. Strong was a granddaughter of Mrs. Tabitha Brown, connected with the early history of the Pacific univer-sity. Mrs. Strong was for 61 years a resident of Salem. Three children survive her--Nathaniel Bain of Lincoln county, Oregon; Calvin Bain of New-port, Oregon, and Mrs. W.S. Kinney of Astoria. 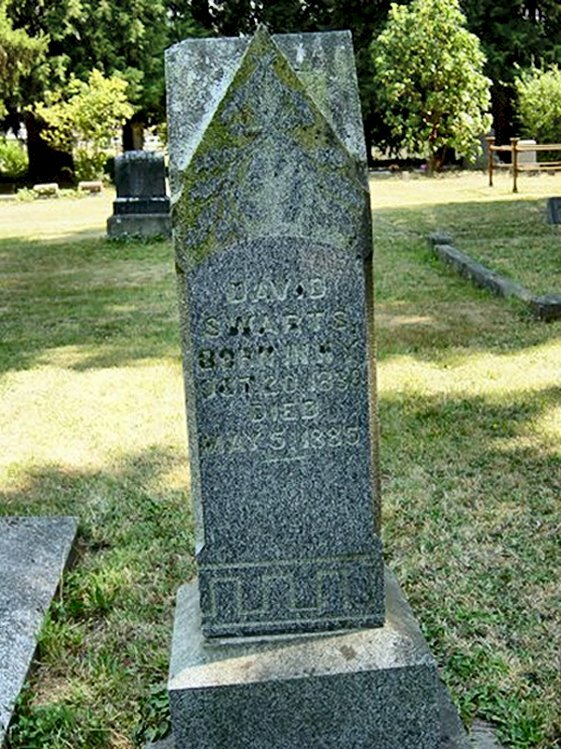 One son, Amos Strong, died in 1893. "In this city, Monday, August 30, 1909, Leonard B. Suitor, aged 38 years of appoplexy. "Independence--Emmitt Summerville, 68, 277 E St., died Tuesday in a local nursing home. Born in Illinois, he came to Salem in 1909 and had lived in the area since. He was an electrician, third to be licensed in Oregon. Surviving are son Emmitt Jr., Independence; brothers, W.B. Summerville, Vancouver, Wash., Gordon Summerville, Great Falls, Mont. ; two granddaughters. "Arthur `Willie' Sutton, 61, of 220 High St. NE, died Wednesday in a local hospital. He was born in Wisconsin, lived in Salem for the past four years and was an active member of Englewood United Methodist Church. He joined the church after release from Oregon State Penitentiary. Rev. Keith Maxwell, pastor, said Sutton contributed food and other goods for the needy and provided holiday treats for church youth. Survivors include sister, Mrs. Bessie Comstock, Galesburg, Wis.
"Former Salem Man Dies of Wreck Injury--Perl Henry (Barney) Swabb, 68, who formerly lived in Salem, died Friday at a McMinnville hospital from injuries suffered in a highway accident about three weeks ago. The accident occurred in Yamhill county on the coast highway near Willamina. Swabb had been hospital-ized since the accident. 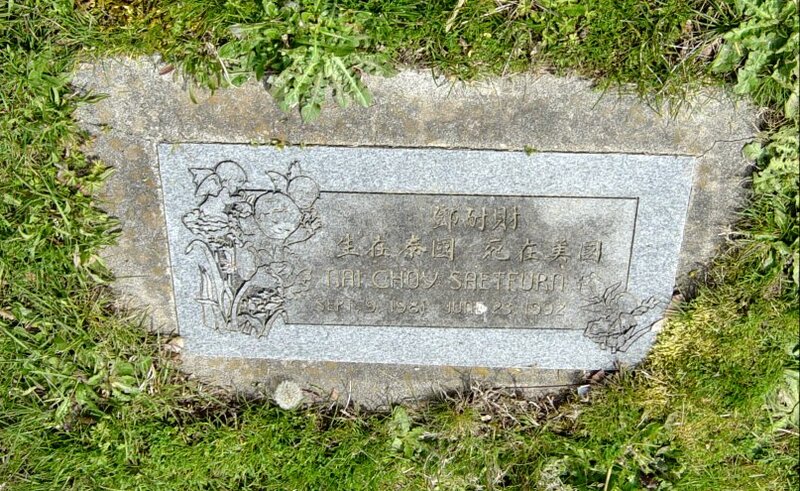 A resident of Cloverdale in recent years, Swabb was born at Chesterhill, Ohio, Oct 1, 1887. He spent most of his boyhood and youth in Salem. At time of his death, Swabb owned a string of fishing boats at the coast and previous to that he and his wife, Millie, operated a fish cannery at Pacific City. At one time he operated a taxi service in Portland and also spent many years as a cook. Surviving in addition to the widow are a sister, Mrs. George Kitley, Salem, and a brother, George C. Swabb, Lakeside, Ore.
"Swarts--At the home of her parents, Mr. and Mrs. Lon Swarts, four miles east of Salem, Saturday, March 1, 1890, of pneumonia; Alice Swarts, aged 19 years. Last Saturday Mr. Swartz was in the city during the forenoon and returned home. He then went with his team over to the sawmill after a load of lumber, and returning had got within a quarter of a mile of home when he was fired upon, apparently from the fence corner, the shot taking effect, as above stated, in the head and neck. He must have fallen thence to the ground, and his assassin or assassins then approached and putting a pistol close to his head fired, as they supposed, the farewell shot. The shot powder burned his neck where the ball entered, and gave the evidence of the position in which the weapon must have been held. The parties doing the dastardly work then ran away, leaving the old man weitering in his blood, while the team stopped near the fence, where they were found the next morning, yet hitched to the loaded wagon. "Schwartz--In Portland, July 4, 1912, at 1:20 a.m., Miss Edith Schwartz, aged 23 years, 3 months, from pneumonia. "The Remains Brought to Salem--Edward Swartz's Funeral Will Be Held Today---Report of the Coroner's Inquest---By last night's overland train the remains of Edward Swartz were brought to Salem and at once conveyed to the undertaking rooms of Olinger & Rigdon on Court street where they will be kept until a short time prior to the funeral, which will be held today at 11 a.m. at the First M.E. church, after which the body will be conveyed to Lee Mission cemetery on Asylum avenue for interment. 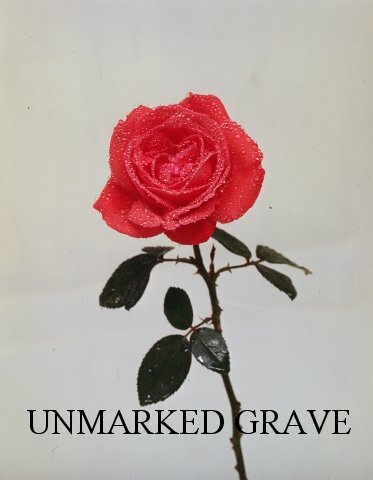 The corpse is encased in a beautiful coffin which will be open this forenoon for the benefit of those that may wish to take a last look at the victim of a drunken father's murderous deed. "Alonzo Swartz was taken before Justice H.A. Johnson yesterday morning and arraigned on the charge of murder. Deputy District Attorney A.O. Condit was the private prosecutor and the criminal information reads as follows: `The said Alonzo Swartz on the 29th day of March, 1895, in the county of Marion and state of Oregon, then and there being, did then and there unlawfully, feloniously, purposely and of deliberate and premeditated malice kill Edward Swartz by then and there unlawfully and feloniously striking, cutting and stabbing and killing him the said Edward Swartz with a knife, contrary to the statutes in such cases made and provided and against the peace and dignity of the state of Oregon.' Messrs, Hayden & McNary appeared as counsel for Mr. Swartz and a postponement of the preliminary examination was asked for until Friday afternoon at 1:30 o'clock. This was granted by the justice of the peace and the old man was taken back to jail. `It was a pitiful and sad sight at the coroner's office. Three of the children of Alonzo Swartz, having been subpenaed to testify at the inquest had come on the Southern Pacific train from Salem. There were two daughters, just entering upon womanhood, and their little brother, 14 years old. They waited patiently in the general room of the office for their turn to tell their story of trouble. And in the back room, stretched upon a slab was the body of their brother, with a great gash in the left side of his neck, showing where the knife had entered and severed the arteries. `Walter Swartz, the 14 year-old brother of the dead man, was the first witness called. He told a plain and intelligent story of the trouble. At times he showed a tendency to be as lenient as possible toward the father, and then again in telling of the ill-treatment of his mother, he showed the feeling that controlled him and the remainder of the family. `But the most succint story of the affair was given by Emma Swartz, a daughter, about 20 years old. She, too, evinced by her manner that long years of suffering through the ill-nature of her father had created in her a bitter hatred of him, kept from explosion by a remembrance of the affection which had long ago died away. `Swartz and his son, Edward had come home to supper between 8 and 9 o'clock on the evening of March 29th. He immediately began to quarrel with Mrs. Swartz over the age of the son. Swartz insisted that Edward was 21 years of age, while his wife said he was 22. He told her to get a book containing the family record, which she did not do immediately. Then his anger broke loose. `If you don't get the book I'll shoot your damned head off!' he explained. `Edward defended his mother, and had angry words with the father as the other children looked on cowering in fear, and Mrs. Swartz, frightened had left the room. `When it comes to murder at home, said the son, it is time for me to get off the place. And he arose, took his coat off the rack, and was putting it on when the father went for him. `With a pocket knife which he had been using at the table, he cut the son in the neck. He struck again, and cut Edward under the left side of the arm. His coat was half on so he could not defend himself. The father slashed at him several more times, and then he fell to the floor from loss of blood. `He reached for his rifle which hung on the wall. Taking it down he pointed it at his son, lying in his blood upon the floor, and pulled the trigger. Mattie and Emma, the two sisters sprang forward, and grasped it and his fury passed off. Edward was cared for at home several days, and then as he grew worse was sent to St. Vincent's hospital in Portland, where his wounds, though sewed by skillfull physicians, would not heal. He bled to death from the cut in his neck. 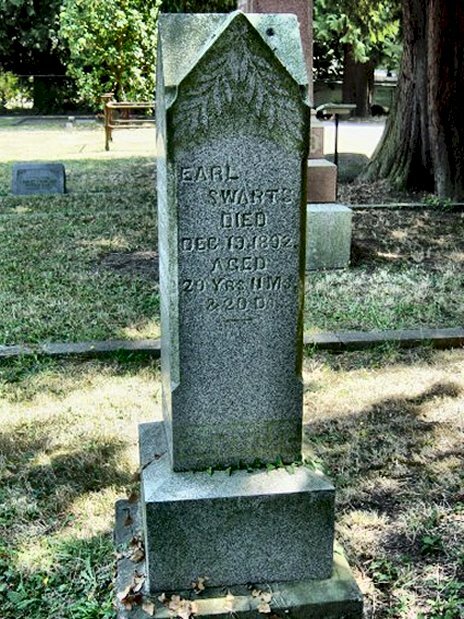 `When Emma had finished this recital in detail, George F. Porter, a brother of Mrs. Swartz, living at Grand Ronde, was called to identify the body and describe Swartz's disposition. He corroborated the statements of the children, and said that they had not told half that might be said about their father's unbearable disposition. "Swarts--At the residence about five miles northeast of Salem, on May 20, 1888, Harley, youngest son of Alonzo Swarts and wife, aged one year and six months. "Swartz--At the Salem Hospital, on Thursday, July 26, 1906, at 2 a.m., Ivan Swartz, aged 20 years. "In this city, at 1 a.m. Monday, May 1, 1899, Lillie, the seven year-old daughter of Alonzo and Mary E. Swartz, of appendicitis. The deceased had been a sufferer from appendicitis for some time and was recently brought to the Salem hospital for treatment. But the disease had progressed so far, the physicians decided not to perform any operation, the child's frail health not warranting it, as she did not possess the constitution required to stand the shock and consequent upon the operation. "At the home of her daughter, Mrs. Emma Dunn, of Dallas, Monday, June 9, 1913, Mrs. Mary E. Swartz. Mrs. Swartz was the aunt of Ralph Swartz, S.S. Swartz, Mrs. H.T. Eoff, Miss Esther Swartz, Mrs. Ralph Desart and James Swartz, and a sister-in-law of R.L. Swartz and Mrs. H.A. Tanner, all of Salem. "Richard Swartz Pioneer, Dead At Age Of 81--Richard L. Swartz, 81 years of age, a resident of Salem for the past 70 years, died shortly after noon Monday, August 13, 1922, at his home on the Garden Road four miles north-east of Salem. Mr. Swartz suffered a stroke of apoplexy on Sunday, August 5, and this, coupled with his old age, caused his death. Mr. Swartz crossed the plains with a large immigrant caravan in 1852. Many miles he trugged along the Barlow Trail, so called because it was laid out by Captain Barlow, founder of the Barlow trading station near Canby, with an ox goad in his hand. The caravan was made up of 40 wagons and 150 people. About 70 of the people were men. So large was the train that, although Indians were seen from time to time, not even a war-whoop was heard. Arriving in the Willamette Valley, Simon Swartz, father of Richard, liked the country so well that he located here rather than going on into California as planned. As all of the donation land claims had been given out, the father purchased a 640 acre tract of land four miles northeast of Salem for the sum of $1,000. It was on a part of this land that Mr. Swartz died Monday. "Death Claims Simon Swarts--Simon S. Swarts, 69, hop grower and son of a pioneer Willamette valley family, died in a Portland hospital Saturday. He had lived at 1660 S. Commercial st.
Richard and Caroline Swarts, his parents, came to Oregon by ox team in 1849. He was born at Sublimity in 1877, afterwards moving to Salem where he was a member of the First Methodist church and the Elks lodge. Surviving in addition to his wife, Viola, Portland; are two daughters, Mrs. Gertrude Turner and Mrs. Ethel Jones, both of Portland; two sons, Lester L. Swarts, Warm Springs, Fla., and Ralph Swarts, Santa Paula, Calif.; three sisters, Mrs. Esther Payne, Salem; and Mrs. Belle Goodrich and Mrs. Grace Strickler, both of Port-land; and a granddaughter, Charlene Ray Swarts, Santa Paula, Calif.